This is a general way to solve a problem in Mathcad: a user usually types the (new) source data and some operators to work it out in the worksheet, or uses his own or other ready-made procedures and obtains a result. This chapter contains not only some descriptions of the instruments for input/displaying information but also a review of their development and their critical analysis. 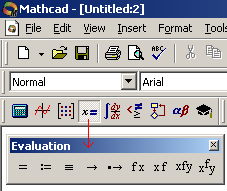 When Mathcad appeared on the market of computation tools, it was advertised as, and was called a super calculator: if one clicks = (the evaluation equal sign) after an expression Mathcad shows the result (Fig. 1.1). The equal sign is the usual “thin” equal sign located on the upper-right corner of the keyboard. There is also a “bold” equal sign of equality, Boolean equality, inserted by clicking the keystroke <Ctrl>+<=> or by the corresponding button from the Boolean toolbar. A novice user often confuses these operators and presses <Ctrl>+<=> instead of <=> or vice versa, that is, in turn, tangles the calculation. There was no such confusion in the DOS-versions of Mathcad. Keystroke <Ctrl>+<= displayed not a “bold” equal sign but a wavy line; a half of an approximate equal sign. By the way, that corresponds to the essence of the solved problem, for example, in finding the roots of a system of equations in a Given/Find solve block (See Ch. 2).The roots of such system returned by the function Find called numerically and not symbolically, make the left part equal to the right one approximately rather than exactly. 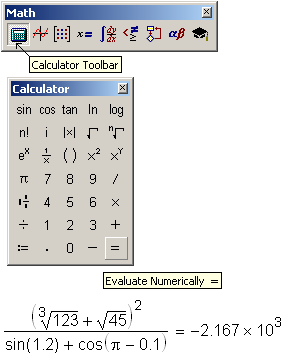 The term “super calculator” remains partly in Mathcad in the name of the toolbar Calculator (see Fig. 1.1). This contains the basic mathematical functions and operators as well as the operator = (the latter showing as Evaluate Numerically when the mouse pointer hovers over the button). 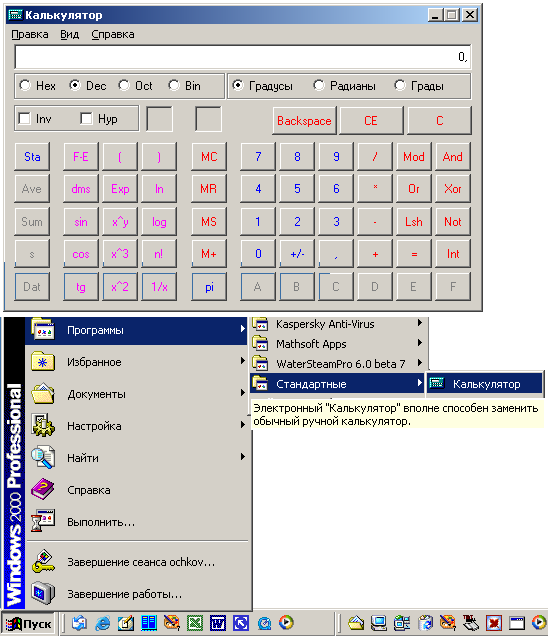 This toolbar actually copies the keyboard of the “scientific” calculator, the real one or virtual, for example, such as contained in Windows. Fig. 1.2 shows the so-called scientific calculator, and the commands to call it in one Windows version. The equals sign = has the same evaluation effect in another popular calculation environment, the electronic worksheet MS Excel. However, there it is placed not at the end of a mathematical expression as in Mathcad (see Fig. 1.1), but at the beginning (Fig. 1.3). Both in Mathcad and in MS Excel the numerical result is displayed just after typing a formula and pressing the Enter key (automatic mode set by default) or after pressing <F9> key (automatic and manual modes). MS Excel shows the result in the cell contained the corresponding formula (cell A1 in Fig. 1.3) substituting for the formula itself. Therefore, we cannot see simultaneously both all the formulae and its results. In Mathcad, the result is placed to the right of a formula and does not cover it. 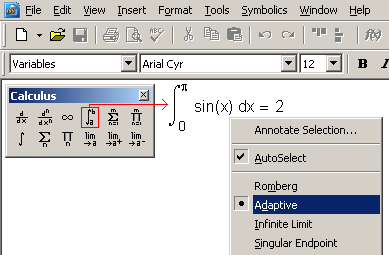 Mathcad has a mode which shows the result of an analytic conversion in the place of the source expression. The problem of whether to show simultaneously both the formula and its result or to do it in turn is connected with, first, saving the spare place on a screen and paper of a printer and, second the aim of calculation, its direction. If the aim of a calculation is mere practice, working out new data and showing a result, the formula would be unnecessary. If the study of the calculation is necessary for educational purposes, additional checking of the result, or making some changes, the formulae would not be excessive. Mathcad has the instruments to hide the formulas, which will be discussed further. We will note straight away that the calculator in Mathcad (Fig. 1.1) differs from other similar calculation systems (See Fig. 1.2 and 1.3). It can work both with figures and with physical quantities. Figure 1.4 shows the Mathcad calculation of the power of a human heart having the following parameters: it pumps 70 ml of blood per minute (mean statistic of a man at rest), the pressure increases from 80 to 120 torr, and efficiency of this living pump equals 70%. Mathcad has built-in units for basic physical quantities as well as fundamental mathematical constants, such as e (the radix of natural logarithm) or p (ratio of circumference to its diameter), etc. A detailed description of this Mathcad feature will be given in sec. 1.4. Mathcad also has a quite thorough reference book containing basic mathematical, physical, and chemical constants, which can be copied into a worksheet with corresponding units. For example, Fig. 1.5 shows how the calculation of the well-known Einstein formula E=mc2 could be made in Mathcad, taking velocity of light in a vacuum from the Reference book. Figure 3.1 from ch. 3 shows that we transferred not just a constant but the mathematical formula for a cone volume calculation from the Reference book into the worksheet. The Reference book is accessed by clicking Reference Tables from Help menu. There are two other principal differences between Mathcad and Excel. The formulae in Excel are typed in one string and the mathematical operators are written in “programmer” form: for example, x^2 instead of x2 etc. This notation has such an excess of parenthesis so that only a computer but not a man can read rather long formula. For example, it is sometimes difficult to understand where the nominator or the denominator is. A formula in Mathcad follows a “many-storied” natural format. There is a second considerable difference. The worksheet in Excel is divided into columns and lines at the intersection of which can be entered required information, numbers, test, formulas etc. The Mathcad worksheet is a “clean paper” where we can type anything anywhere. In addition, there is a possibility to insert information in table format (see Fig. 1.18 and 1.20). 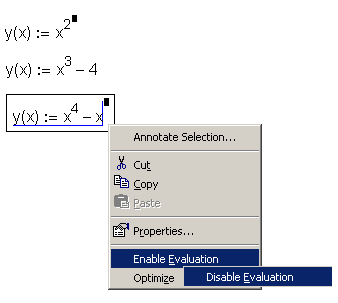 The Evaluate Numerically operator presents its evaluation using a set of defaults that can be modified by clicking Result from Format menu or double-clicking the result itself. 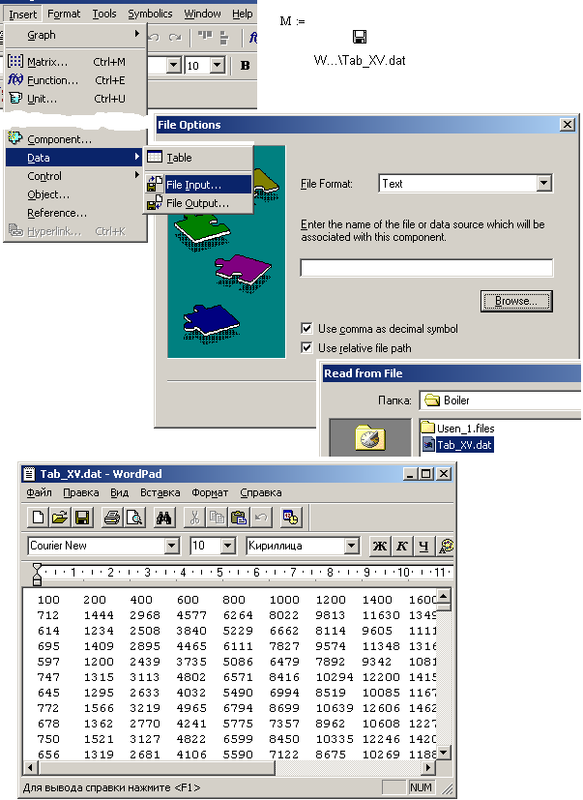 Figure 1.6 shows two inlays of the dialog box for formatting a numerical result. The following is a list of numerical evaluation defaults, far from complete, which also evolved through the Mathcad versions. 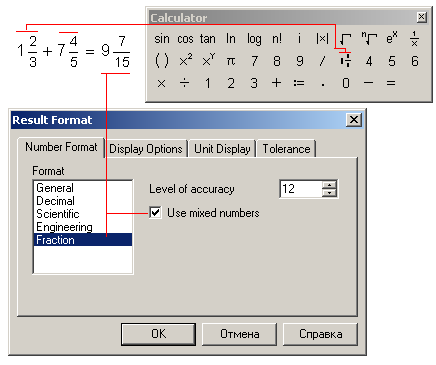 Inserting a number as vulgar fraction is possible through normal addition or division (for example, а:=1+1/3) or, if one prefers omitting the plus sign, by clicking on the Calculator toolbar. Mathcad users can both change these defaults formatting the current result and change the worksheet default. After changing the settings, click Set as Default in the Number Format tab from the Result Format dialog box. The second most important operator is the assignment (definition) marked as :=. To enter it just press <:> (colon). Mathcad courteously adds the second sign (=) moving the cursor to placeholder for entering a number or an expression. For example, Fig. 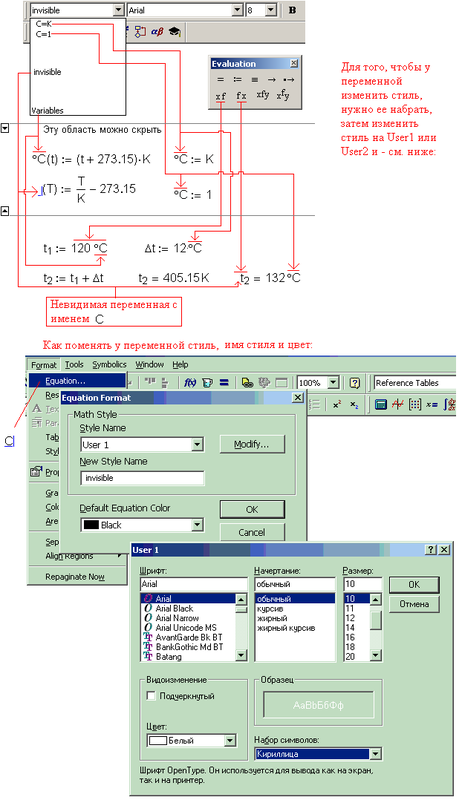 1.7 shows insertion of three user variables, a, b, and c, two of which (a and b) are the source data, and the third is defined as the result of the calculation by the formula. Another way to enter the assignment sign in Mathcad is to click the corresponding button on the toolbar (for example, see left bottom corner on the Calculator toolbar in Fig. 1.1). The third way is to copy and paste the assignment operator entered before. In Mathcad any operation can usually be done at least three ways. a = 1 a = 1 What is this? The operator := should be called more precisely the half-global assignment because we can compute with the function defined by the operator anywhere to the right and below of the expression that defines it. The variables in the calculation are sure signs that distinguish programming from simple calculating ― compare calculations on the Fig. 1.1 and 1.7. The variables in Mathcad are discussed in section 1.2. The third operator is interrupted by the error message “Variable is not defined”. An operator located a little higher than the others may be imperceptible to your eyes but will interrupt the calculation. To avoid such errors the recommended practice is to type the operators in columns pressing <Enter> after each expression. To make worksheets more compact we can use the second dimension in a finished worksheet, locating some operators in lines. It is also possible to have the third dimension in Mathcad (see section 1.5). The symbol for the global assignment operator is ≡. We introduce it by typing <~> or by clicking on the corresponding button on the Evaluation toolbar. The scope of the variables and functions defined by it is the entire Mathcad worksheet; it spreads from operator ≡ wherever one wishes. However, using this operator is not highly recommended; it breaks cause-effect relation and confuses those who aim to study the document: a variable has a defined value but is not clear where it was defined. Moreover, this operator can define only constants (for example a≡3, the operator is sometimes called the operator of constant definition), but not the expressions containing other constants (for example, a≡2b). Some users define the variables that change the values in calculation using the operator := (for example, from a:=1 to a:=2) and the variables that do not change using the operator ≡. This users fail to take into consideration the difference in scope. Although, the global assignment operator can influence to top of the worksheet, for example, damage plots created by QuickPlot. Separating assignment operators := constant from ≡ constant can be useful before the key word Given. Thus we comment that some variables are constants, while others are the first approximation to results (see sec. 2.5.2). Such separating is useful to make a Mathcad worksheet well suited for Internet publication (see chapter 7). Mathcad can solve problems numerically (approximately) as well as analytically (symbolically). The symbolic equality operator is ®. It will be discussed below. As Fig. 1.8 shows the interface operators described above =, :=, ≡, and ® are collected (some of them are duplicated) in the distinct panel Evaluation. Section 1.2 deals with the other buttons in this panel. Mathcad also has a local assignment operator. Operator ¬ makes the variables defined only within a Mathcad-program. Chapter 6 will have more about that operator. Both operators ¬ and ≡ can be changed to the more customary = . Fig. 1.7 outlines how to do it. By means of the very convenient built-in feature, Style of variables, Mathcad allows distinct variables to have the same textual name. By default, the variable introduced into a worksheet is assigned the style Variables (Fig. 1.9). A Mathcad user can change the style of a variable and insert a new variable with the same name into a worksheet. Fig. 1.9 shows this feature of Mathcad: a certain moment of force, m, is calculated (the product of force (or, rather, weight — the product of a mass m and acceleration of gravity g) and arm length of the force application) using two variables of the same name. Speaking about the texts and comments Mathcad offers a set of style for dealing with text regions (see sec. 1.3) allowing the user to format letters, words, paragraphs (title of the first level, title of the second level) practically as in MS Word. Beginning from the eighth version, Mathcad allows to enter the evaluation equal sign typing not <:> but <=>. The point is: if the variable is not defined the operator = (displaying) is changed automatically into := (definition). Otherwise, if the assigning variable has already been defined its numerical value is represented. So, one can check that the name is free: neither a user nor Mathcad has defined it yet. Such technique allows us to omit a number of errors mentioned before. First, some predetermined variables could be changed: е:=5, m:=1, A:=2 etc. Variable e is the radix of the natural logarithm and variables m and A are units of length (meter) and current strength (Ampere) accordingly — see Fig. 1.9. Second, one could forget that a user has already defined the variable and assign it something new. The situation when the same variable has one value in the first part of Mathcad worksheet and another in the second part is not right. The technique of variable redefinition is used when the memory was a limiting parameter in computing so that the spare variable was redefined right away to omit memory overflow. In Mathcad the variable keeping a massive (vector or matrix) can include text, scalar (real or complex number) and vice versa. A variable in Mathcad is not connected with one or another variable type that exists in most part of traditional programming languages. We use such technique now in locating the extensional arrays (vectors and matrixes, simple and compounded) in computer memory (including that working with Mathcad). Although, redefining the new smaller array or ever a scalar value does not change the volume of memory (the mechanism of static arrays but not that dynamic). Besides, this technique is not applicable to arrays. If one types V in a spare Mathcad worksheet [0 and pushes the button <=> to enter zero element (constant) of vector v Mathcad displays an error message instead of equal sign. 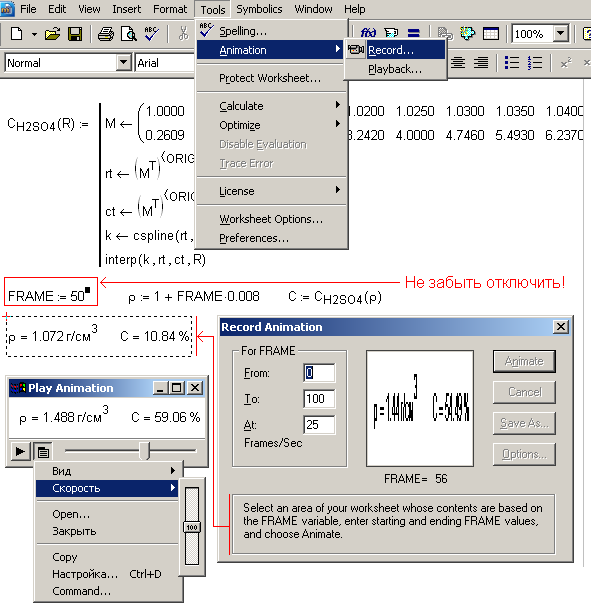 The mode of automatic change of assignment operator from = to := (such a hybrid of two operators called SmartOperator )is disabled by throwing of a flag from Context-sensitive equal sings of the General tab from the Preferences dialog box calling by the same command from the Tools or Math menu in Mathcad 2001i and in earlier versions (see Fig. 1.10). Fig. 1.10 shows a very interesting and useful number 200 in the right bottom corner of the counter Maximum number of undoable action per document. This is new feature appeared in the 11-th version. Here is a typical situation: one wakes up in the morning and thinks, “I made a stupid mistake yesterday, could I return “to yesterday” and “improve” it?”. Alas (or fortunately), it is impossible in real life but is doable to some extent with computers. Just push the Undo button. Earlier versions of Mathcad allow us to do that only within the limits of a formula while the pointer is not taken away from it. 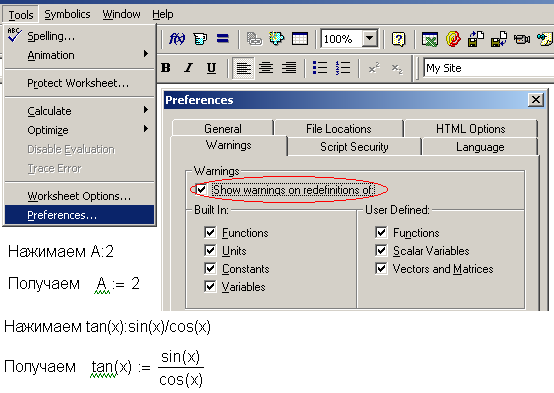 Versions eleven and twelve of Mathcad allow the command Undo to affect the whole worksheet. In Fig. 1.10 the number indicated 200 is the number of such steps. At a certain stage of Mathcad development it becomes possible to enter some interface operators in tandem, feeding one input/display operator into another. Thus, point 1 of Fig. 1.11 shows the use of the operators ® and = (symbol and numerical result) in solving the equation. The advantage of a symbolic result is absolute accuracy and numeric shows the distinct location on the number axis (or on a plane in the case of complex number). The tandem use of operators allows us to combine those advantages. Including one operator (one function) into another operator (function) on the place of operand (argument) is a traditional programming method. But it is quite exotic for input/display operators in Mathcad. Fig. 1.11 at point 2 shows us the tandem operators at work. := and ® (Definition and Evaluate Symbolically) allow us to enable symbol mathematics, for example, to create a user function or its derivative. Those two useful tandems (points 1 and 2 in Fig. 1.11) were in the category of undocumented techniques and later on became kind of half-documented: they are not described in the product documentation but are recommended for use in different sites Mathcad-supported sites including the developer’s official site www.mathsoft.com. 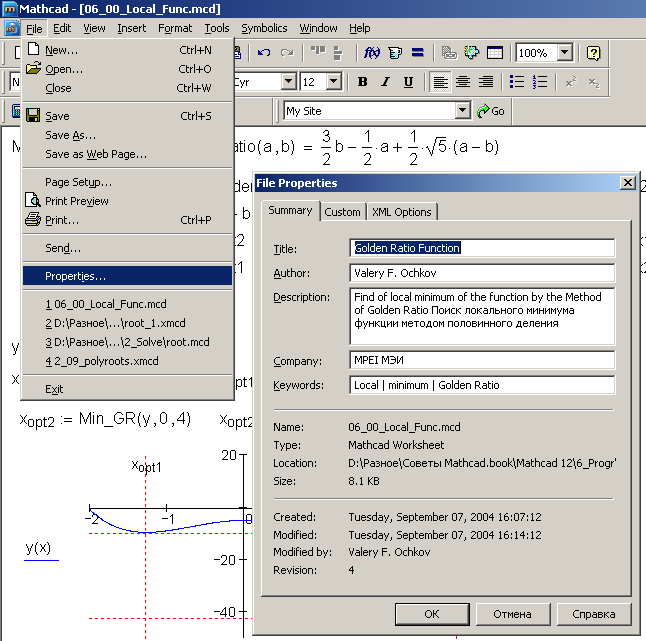 The tandem of operators := and ® is the same as Optimize mode from the pop-up menu shown in point 2 in Fig. 1.11 which makes analytic transformation before calculation. If such transformation have been made, a red star appears to the right of transformed expression; but not the expression itself as is the case with the tandem := and ®. Still undocumented is the tandem operators ¬ and ® ( local definition and symbolic equal sign, see point 3 in Fig. 1.11) which enable us to look through the variables in programs and is very useful in checkout. This feature is discussed in Ch. 6. The evaluation equal sign became a stumbling block for those who started Mathcad ten or fifteen years ago, hearing of its unusual abilities for calculating sophisticated formulae (see Fig. 1.1), making graphs (see sec. 1.6), animations (see sec. 1.7), solving equations and systems of equations (See Ch. 2). Through a habit formed by working with Fortran or BASIC users typed a= in Mathcad instead of a: and… refused to work with this mathematical package further. An error, unintelligible at first glance, had emerged: Mathcad informed them that a variable is not defined. Users tried to define that error by operator of variable type being guided by experience of working with programming languages, but Mathcad has not such operator. By the seventh version Mathsoft company had “surrendered” and stopped demanding users to type а: instead of more convenient and customary a=. Now the pendulum has swung to the opposite side: now to assign the value to a variable it is recommended to type a= rather then а:. We could recommended that Mathcad developers excluded the operator := at all but it is necessary for changing the value of predetermined variables (for example, TOL:=10–7, ORIGIN:=1) and for defining a user function or an element of a vector. Although, even in these cases one can omit operator := coping it from the place where it was created by “smart” operator =. r F = 1 F the unit mode is not disabled. In this case, Mathcad remind us that farad (unit of electrical capacity) equals to 1 farad and this variable name is occupied. r F = number means that the user variable with name F already exists in the worksheet. r F = function means the user function with name F already exists in the calculation. In Mathcad 12 the word function now appears in brackets: F=[function]. r F := — means that the name is spare and available for use as a function or a variable name. There is another variant: if the name of planning function coincides with that of the built-in function after pressing <=> it will be duplicated, for example line = line. The Mathcad user should decide what to do in this situation. In some cases, reassignment of a function solves certain difficulties of calculation. The name will be duplicated in mode of “early” Mathcad calculation mode. In the Higher Speed Calculation mode Mathcad shows line = function. Besides, Mathcad 12 has only “quick” mathematics. Old habits die hard: it is impossible to break Mathcad users of the habit of using operator := to define variables or functions and force them to use = which ,as we noted before, automatically chooses what a user want of him : definition or displaying. Because of it the users continue to make the errors mentioned above in connection with reassignment of variables. 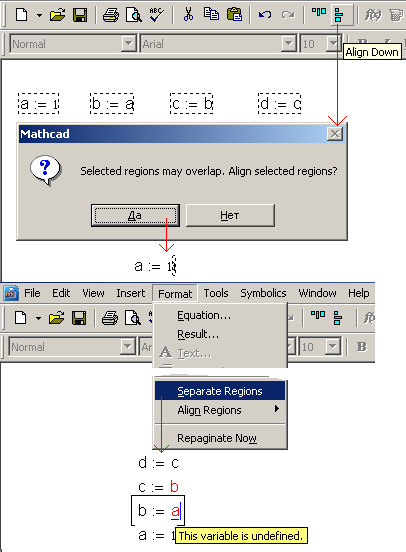 Through it Mathcad 11.1 (Mathcad 11 was published and patch 11.1 was released soon after it) provided the user with the mechanism for checking the reassignment of variables and functions, built-in and users, opened and hidden in closed regions (see Fig. 1.22) and in referenced documents (see Fig. 1.21). For this, the Preferences dialog box get the new Warnings tab (see Fig. 1.12). Developers added a green wavy line to the Mathcad armory; in other environments, for example, in Word it is used to mark incorrect punctuation. If such line appears in a Mathcad worksheet under the name of assigned variable or defined function the user should correct an error or just size up that something is out of order here and knowingly reassign the variable and/or the function name. 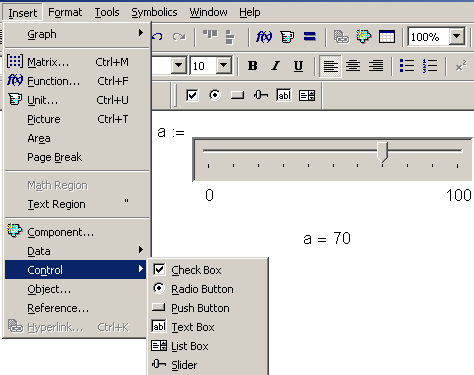 Starting with Mathcad 2001 the operator := assigns both the numerical values and text literals, for example, c:=123 or c:="text", and uses visual programming standard controls: Check Box, Radio Button, Push Button, Text Box, List Box, and Slider shown in Fig. 1.13. The command Control both inputs the data into the worksheet and shows the result (Fig. 1.16 shows such an example). Controls appeared in Mathcad to simplify the input of new data. Fig. 1.13 shows how the value of the variable a is changed by simple mouse actions without any typing. At that, Mathcad clearly shows the range of the variable (0—100), which cannot be overwritten by a user by mistake or knowingly and the current location of the variable within the range. The detailed description of these controls contains in Ch. 7. As the need arose to have worksheets accessible by the Internet Mathcad acquired the so-called Web Controls (See Ch. 7 about Mathcad Application Server) shown in Fig. 1.14. Unlike the standard Mathcad Controls, they do not require the user to write or edit the programs in one of the supported Active Scripting languages (JScript and VBScript) (see Fig. 1.13). It is not difficult to write the program but the point is that such scripts are undesirable for Internet use, so that they were left out. Besides, Controls make the documents “heavier” noticeably increasing the size of corresponding file. The stages of preparing Mathcad worksheets for Internet publication are described in details in Ch. 7. The numerical evaluation operator has evolved too, or rather not the operator itself but its function. 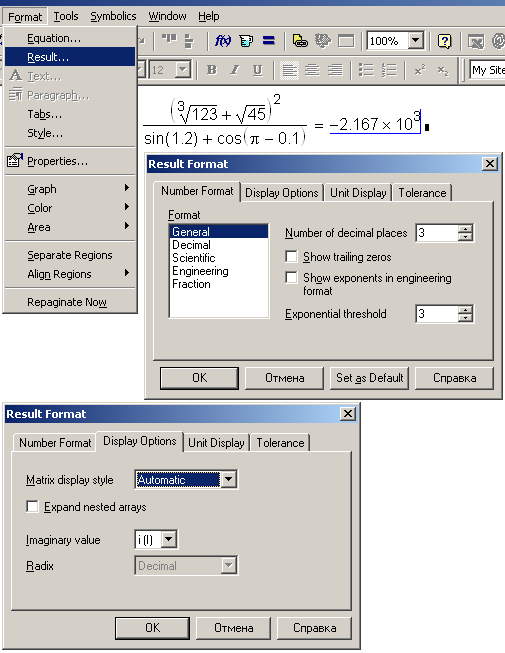 Thus, current versions of Mathcad allow users to show numbers also in non-decimal systems, both as vulgar and decimal fraction, in scientific or in engineering formats, etc (see Fig. 1.6). However, operator = has not got any distinct differences or additional format options apart from the cross over with the operator := (SmartOperator, see Fig. 1.10). Such changes are crucial from the standpoint of development of Mathcad Application Server (See Ch. 7). In particular, it is often required to hide sigh = and everything to the left of it. This is possible in operator := using Controls and Web Controls (command Hide Arguments from pop-up menu shown in Fig. 1.15). It would be so convenient if the numbers and texts could appear and disappear without showing their sources: 123 and not b=123. When showing text, it is desirable to hide inverted commas that frame it. Also, it is desirable to change the format of numeric and text literals (font, size, color etc) without using macros. For example, Fig. 1.16 shows the way of changing highlight color of the variable (operator b=) depending on its value by small macro program. 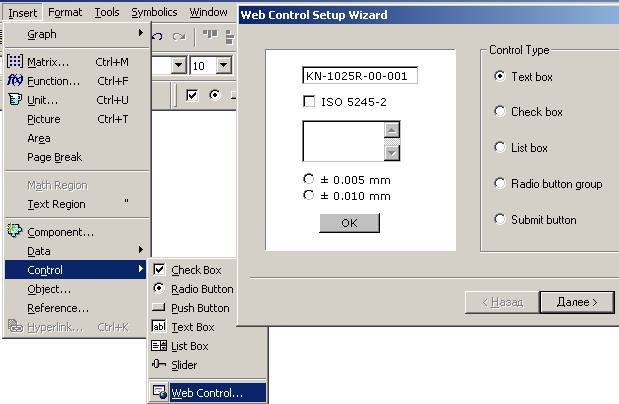 The macros are used to format Controls. As we noted before, Web Controls require simple dialog boxes for formatting. Fig. 1.15 shows one of that used to format a list; the other examples are contained in Ch.7. Especially we should take into consideration inserting the arrays (vectors and matrixes) into a worksheet, the data formatted in rows and columns. This storage method is widely used both in paper calculation and in computation. 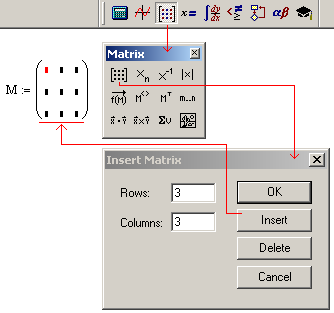 The simplest method of inserting a matrix into a Mathcad worksheet is to choose Matrix from Insert menu, shown graphically in Fig. 1.17. However, it is not very comfortable to enter numbers with the Matrix command. First, we can insert at the most 100 array elements in such way. Through this limit many of novice Mathcad users mistakenly think that 100 is the maximum number of elements in a vector or matrix although user documentation said that it can reach up to 8 million. The vector (matrix with one column) up to 50 elements is inserted simply by command v:=stack(element1, element2, ...). The built-in function stack turns the list of its arguments (which can be both vectors and matrixes) into a vector. It is more convenient to insert matrixes via Insert | Data | Table as shown in Fig. 1.18. This command inserts the assignment operator := into the worksheet. 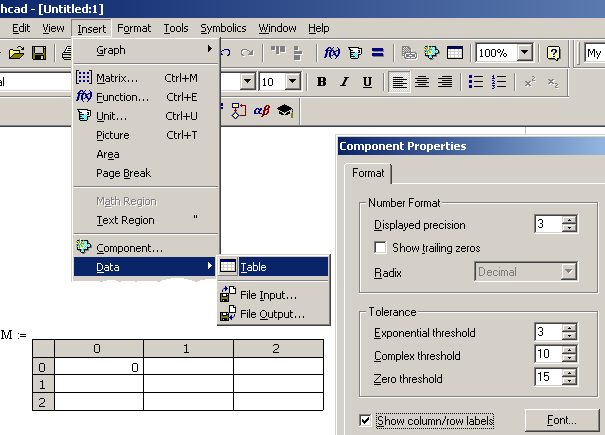 Its right operand is rather bulky table (an analogue of the Excel table); the user can type new information in the its top left region forming the picture on the screen via the Component Properties dialog box that also shown in Fig. 1.18. The earlier Mathcad versions have “table” in the list of components (see Component in Fig. 1.18). Later on this important component was located in a distinct menu item, Data, which contains two more commands discussed below. If a user has installed both Excel and Mathcad, entering of large volumes of information can be automated. An Excel table is inserted into Mathcad worksheet by choosing Insert | Component... | Microsoft Excel and then in the Excel Setup Wizard dialog box choose Create an empty Excel worksheet or Create from file. After that we can point the part of Excel table where the information from Mathcad is transferred (Inputs) or conversely the information is transferred to Mathcad variable from Excel table (Outputs). Fig. 1.19 shows that we “crushed a fly with a steam-roller” outputted variable Cost in Excel using a special format of electronic worksheet which inserts thousands spacer, white space between three numbers, into numbers and thus, simplifying its reading. However, one can “crush” earnestly, for example, to access those Excel functions that Mathcad does not have (calendar functions) or to make Excel plot in Mathcad (pie chart). Besides, to enter data in Excel table is more convenient and quicker: one can use special Excel features –AutoFit and others. After entering data, the Excel table can be removed to make Mathcad worksheet lighter, and in such case, and so that those who have not installed Excel can work with the worksheet. 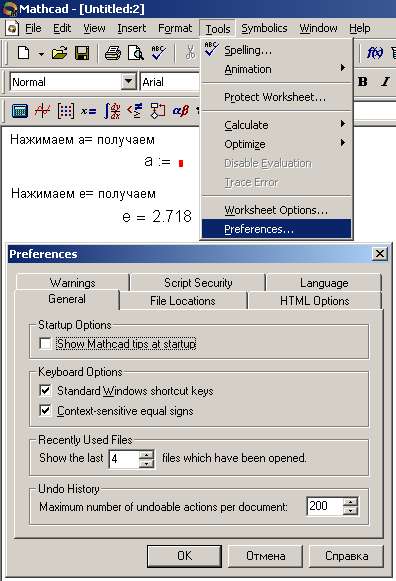 Beside Excel, one can insert other Windows applications to Mathcad to expand its functionality and one can add Mathcad worksheet into other applications, Word, for example. 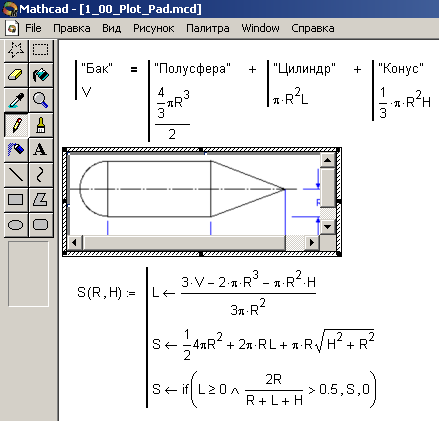 Nevertheless, it is only worth inserting other programs into Mathcad worksheet if they provide calculation and other features for which Mathcad is not sufficient. The point is that the worksheet is sent to another user who does not have that application the worksheet will fail. In addition, a Mathcad worksheet containing other applications is difficult to publish on the Internet (See Ch. 7). To insert choose Object from Insert menu, common for all Windows applications. 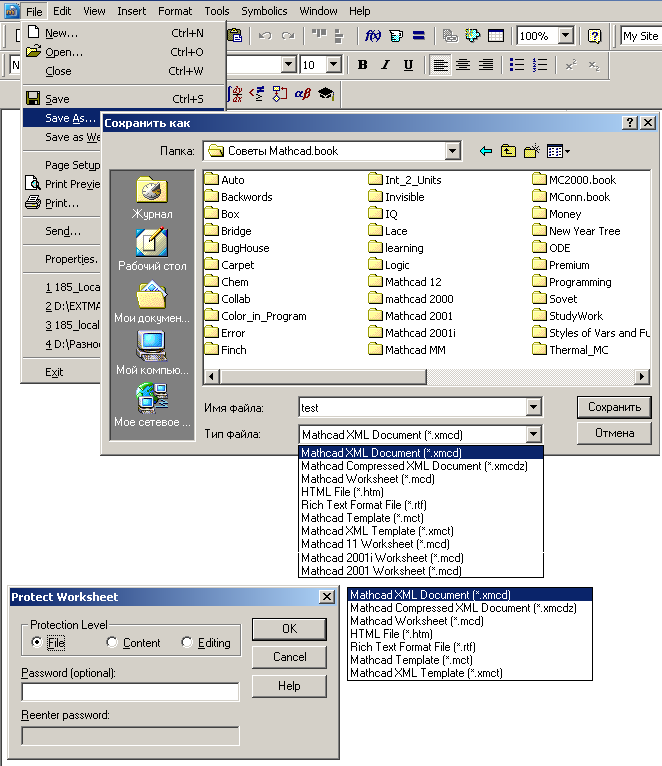 Large tables can be saved to disk as text files and connected to a Mathcad worksheet by inserting the operators of writing/reading a file to/from disk. Fig. 1.20 shows how to create the operator of writing the data from file Tab_XV.dat and to send it to the variable M.
To assign data to the variable M, choose Insert | Data | File Input... that open dialog box, or rather file changing wizard (File Options), in which we can mark the file with required data in “file/disk/folder” Windows system clicking button Browse of the File Options dialog box. In addition, we can choose file format (in opening list File Format) and set the the comma as separator instead of the tab character. The data itself (Fig. 1.20 shows it opening for review or editing in WordPad) can be entered in Mathcad and written to the disk via command Insert | Data | File Output or manually (for example, in Excel), or generated by another program, or received by e-mail et cetera. Besides the command for data changing shown in Fig. 1.20 Mathcad has a set of similar functions (readprn, writeprn etc) accessed by File Access from the Insert Function dialog tab. The length of numeric literal writing to disk depends on the value of built-in variable PRNPRECISION. The main disadvantage of saving data in a file, rather than in Mathcad is that one can send Mathcad worksheet and forget about the file. To exchange information between Mathcad worksheets choose Reference from Insert menu. It is not necessary to contain all the operators for a given calculation within the “current” Mathcad worksheet. They can be written in another worksheet, and saved on a user disk or on any computer in local network. To make them work for us, we must make a reference to the file containing necessary data from the current worksheet. Fig. 1.21 shows such situation. 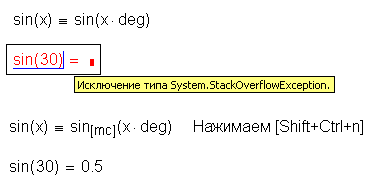 D disk contains Mathcad file sheet.mcd with address D:\Documents and Settings\user\My documents keeping a single operator с:=a+b; of course, the calculating is interrupted by an error message because the variables are not defined. The other Mathcad document which also shown in Fig. 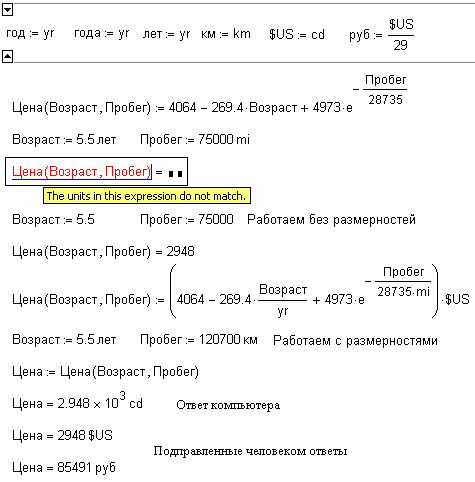 1.21 contains operators of source data (а:=1 b:=2) and the result (с=3). The worksheet named sheet.mcd carries out the calculations contained in the referenced worksheet (which it is connected to first by the command Insert | Reference). As a rule, the referenced documents contains constants and functions covering a branch of applied sciences or having some general engineering significance. With such references, we can make, for example, dimensional a set of user functions in the form of DLL that were turned into built-in i.e. listed in the Insert Function dialog box (see site www.wsp.ru). 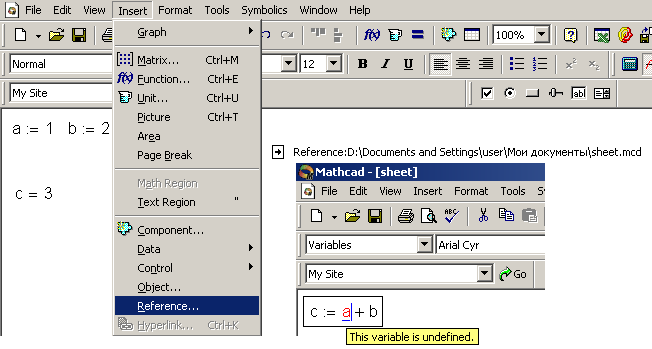 One of the Mathcad’s interface features is the ability to protect or to hide (a part of) the information. As a rule, Mathcad worksheet comprises three parts: area for source data, area for calculation, and area for results. We can delineate these areas in Mathcad worksheet clicking Area from the Insert menu. This command insert two horizontal lines near the mouse pointer, after which the user moves the top line to the start of an area they wish to create and the bottom line to the end of their area (see the top of Fig. 1.22). What can we do with it? First, we safeguard the information against unintended edits by command Format | Area | Lock. After such command, the region enclosed by the area can be viewed but not edited. The second command used separately or together with command Lock is Collapse and this hides the chosen area from a user. The result of these two commands on the area named Calculation shown at the bottom of Fig. 1.22. The user types this name clicking Properties from the area pop-up menu. Otherwise, we can even hide a vestige of this area in Mathcad worksheet by this command. After such manipulations (inserting, locking, and collapsing an area) a user can change the values of a and b and see the result (variable c) but cannot see and edit the formulae. A Mathcad worksheet containing a collapsed area is like a piece of paper, the middle of which recedes into the background by several folds (Japan origami). The antonyms of the commands Lock and Collapse, — Unlock...and Expand, allow us …well, read their names. We can lock an area with a password, a row of symbols, and only knowing that we can unlock and expand an area. We can safeguard Mathcad worksheet without inserting any areas, but safeguarding the whole calculation while keeping some required operators unlocked. Fig. 1.23 shows the menu commands allowing us to protect all, or the most of, the worksheet. To protect the worksheet, choose Protect Worksheet... from the Tools menu, shown in the bottom part of Fig. 1.23. Worksheet protection comes in three levels presented by switches Protection Level in the Protect Worksheet dialog box. The first level, File, the lowest one, protect the worksheet from being saved in some formats, for example as earlier Mathcad versions. Fig. 1.24 shows two lists of file formats for saving the current worksheet even without protection level File. In Mathcad 12 this protection level makes it impossible to save the worksheet as Mathcad 11, 2000i, or 2000. That limitation works at two other levels too. The second level protects existing operators against change by the switch Content but new operators can be created. The third level, Editing, the highest one, does not allow us to change existing operators or to create new. Of course, we can make the “holes” beforehand i. e. turn off protection from some operators (as usual, from those defining source information) by the commands shown at the top part of Fig. 1.23 with operator b:=7. In all levels we can protect the worksheet with a password or without it (options Password (optional) and Reenter password). Some safeguarding mechanisms duplicate each other. We can protect a separate operator or several operators at once placing them into an area (Fig. 1.22) or by technique shown in Fig. 1.23. This duplication occurs because the protection mechanisms were not introduced simultaneously but from earlier versions to new. At the beginning, (Mathcad 2000) it became possible to insert areas into worksheets (Fig. 1.22) safeguarding it against editing only (Lock/Unlock). Then (Mathcad 2001) we could collapse these areas (). Mathcad 2001i got the mechanisms to protect whole worksheet and some of its operators (Fig. 1.23 and 1.24). The previous section considered input/displaying operators = , := , ≡, ¬ , ®. This section will present what those black squares calling placeholders may contain. Mathematics has a term correlation: for example, there are two enumerable sets, and each element of the first correlates with a single element in the second one. The particular case of such correlation is the one-argument function y(x); for example, any value of a angle (х is the first set and argument of a function) correlates with value of sinus (y is the second set and the first function). A middle-aged reader will get this right away well-knowing from Bradis tables such “sets” of angles, sines, logarithms, and other necessary values. Of course, Mathcad does not keep sets of angles, sets of correspondent sines etc but calculates this trigonometric function in accordance with its built-in algorithm. Another question is how accurate and quick these algorithms are. About thirty years ago, a discrepancy appeared between mathematicians and programmers in terms “function” and “operator”. A mathematician reading this book may justly conclude that the author does not fully understand what an operator is and what a function is. Moreover, there is no unity of treatment of these terms in programming. “Operator” in Mathcad has another meaning in BASIC, for example, and vice versa. Thus, BASIC has a convenient operator Swap(a, b) that changes values of the variables a and b: c = a : a = : b = c, but without enabling variable c.
This operator would not be superfluous in Mathcad, either. However, it would upset a stable system functions and operators as it does not return a value but executes a certain procedure. 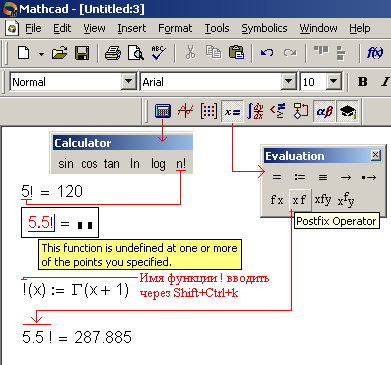 As this operator does not return a value, it cannot be called operator from the point of view of a Mathcad user. On the other hand, Mathcad operators and functions themselves may not return values either (for example the equality a=sin(x)) but be a peculiar comment (see sec. 1.3) and expect to be treated. Besides, function sin of the operator a:=sin(x), for example, does not return a value too. It will return sine of x if the operator a= appeares after the assignment operator. Let us agree that terms “operator” and “function” are application dependent and will discuss not their essence (let the theorists dispute about it) but their differences in Mathcad. If terms “operator” and “function” are considered in respect of the mathematics that we use in calculations but not in respect of Mathcad features (see below about that) we can mark out some aspects dividing Mathcad mathematical mechanisms into operators and functions. 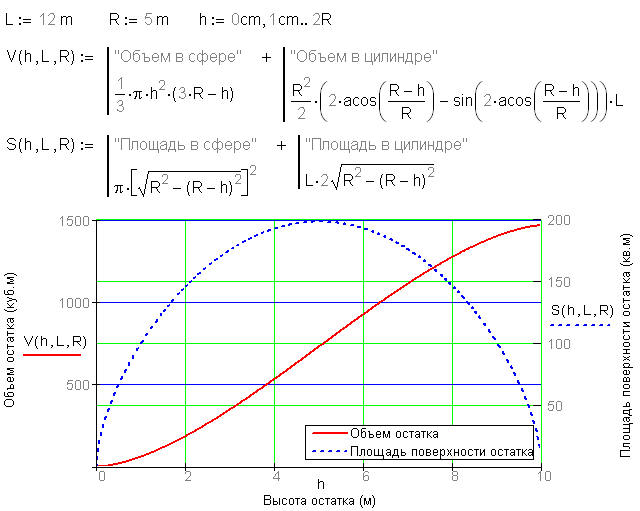 r A definite function is distinguished from others by its name sin(х), cos(х), log(х). Operators differ from each other by symbols n!, ¬x, ׀x׀, ò (see Fig 1.25) etc. Mathcad has three operators with invisible (absent) symbol: xy (power), Xn (element of array or text index), and 2K (multiplication). The visible operators will be discussed in sec. 1.2.3.
r Some Mathcad operators have ambivalent contents. For example, х2 what is it? Is it an operator with two power operands, with the second operand equals to two, or squaring operator with one operand? The second example: 2K is it a multiplication operator or just a variable named 2K (a name of this type is possible in Mathcad, see sec. 1.2.2) etc. Mathcad also has mathematical operations executed both as operators and as functions. For example, the exponent is calling as ex (operator) and as exp(x) (function). Basically, it would be convenient if all Mathcad operators have such twins. First, it would give the users additional freedom in choosing and second, enable them to introduce formulas in the text format that will be noted in Ch. 7.
r All Mathcad functions are equal. However, some operators are hierarchized. Thus, a compound operator 2+2·2 returns 6 but not 8 as multiplication operator has a priority over addition. That hierarchy is altered by parentheses. r The attribute, the fundamental characteristic of a function is of parentheses framing a list of arguments: sin(x), min(1, -7, 5, 4), Find(a, b) etc. It should be noted that the parentheses themselves are a kind of operator in Mathcad and in other computing applications as well as in mathematics as a whole changing the order of operator executing: (2 + 2)·2 = 8 but not 6 as without them. Returning to the previous comment it should be noted that parentheses are not so much an operator for changing the order of operator execution but rather an operator for processing (functional) block and they can be inserted in each other. Such insertion in Mathcad may result in the appearance parentheses changing to square brackets that make it easier to understand them. Besides, that noted above, in Excel the parentheses change color when editing an expression (see Fig. 1). Number of operators ranges from 1 to whatever. Speaking of common mathematical operators the maximum number is 4 (definite integral (see Fig. 1.33), sum and others). But if we consider that a plot in Mathcad (see Fig. 1.7) is represented by an operator the maximum number of operands is questionable. In case of a plot, we can tell about variable number of operands too. Some built-in Mathcad functions have variable number of arguments. Thus, the function root (it returns the zero of an analytic function, see ch. 2) can have two or four arguments. Actually, there are two functions of the same name using different algorithms. The function log usually has one argument but if we write the second, it changes the logarithm radix from 10 (by default) to another determined by the user. Function Find returns a solution to a set of equations and inequalities (See ch. 2) and can have from 1 to 50 arguments. This number 50 is not the limitation of function Find but of all Mathcad functions with variable argument number. Mathcad has a function documented in version 12, the argument number of which, one could say, equals to zero. It is function time and it returns time (in seconds) passing since some date. The date itself is fairly insignificant because users do not generally work with it, but with the period between two calls to it, for example we can use the difference in calculation testing (See ch. 6). It is said that function time has a formal argument of which does not affect to its result. We can call this function without parentheses and a formal argument but as a variable time. The argument of the user functions y(x):=sin(x) or y(t):=sin(t) is called formal too: we can use any other name for the formal variable not only x or t.
We can consider Mathcad built-in mathematical constants p and е as functions having no arguments and that return constant values. The functions are entered into worksheets by clicking correspondent keys: <s>, <i>, <n>, <(> for sine. However, it is better to use the Insert Function dialog box shown in Fig. 1.26. Fig. 1.26 shows the dialog box in Excel for comparison. One of the fundamental distinctions between these mechanisms in Mathcad and Excel is that Excel list contains both built-in and user functions. User functions in Mathcad can appear in the Insert Function dialog box (see WaterSteamePro in Function Category in Fig. 1.26) only if transformed into built-in functions in the form of a Dynamic Link Library (DLL) (see sec. 6.9). As to built-in operators we can insert them clicking the buttons with their pictures on the appropriate toolbar (see Fig. 1.27). The fact that almost all buttons for inserting mathematical operators have their doublers as corresponding key combination (<Shift>+<2> for plots) practically have been forgotten now. As we saw in sec. 1.1 the input/output operators are the special operators. The mechanisms for working with symbol mathematics programming instruments are called operators too (buttons and on the toolbar Evaluation in Fig. 1.27). Some menu commands are referred to instruments of solving the problems. Thus, we can solve an analytical equation or inequality by the command Symbolic | Variable | Solve if we previously type the expression in a worksheet and mark the variable to solve for with the cursor. Mathcad displays the result below (by default), to the right, or in place of source expression. Although, menu commands are seldom used to solve the mathematical problems, as they have almost been substituted for operators. Beside the common way of calling functions, we can call the one or two arguments functions (user and built-in) by clicking buttons fx, xf, xfy и xfy in the Evaluation toolbar. 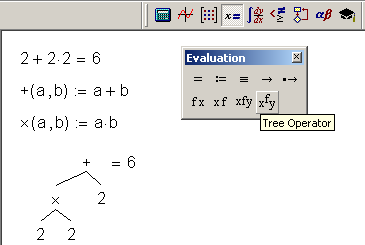 At that, Mathcad displays the placeholders for postfix(xf) and prefix (fx)operators with one operand, infix (xfy) and tree (xfy) operators with two operands. 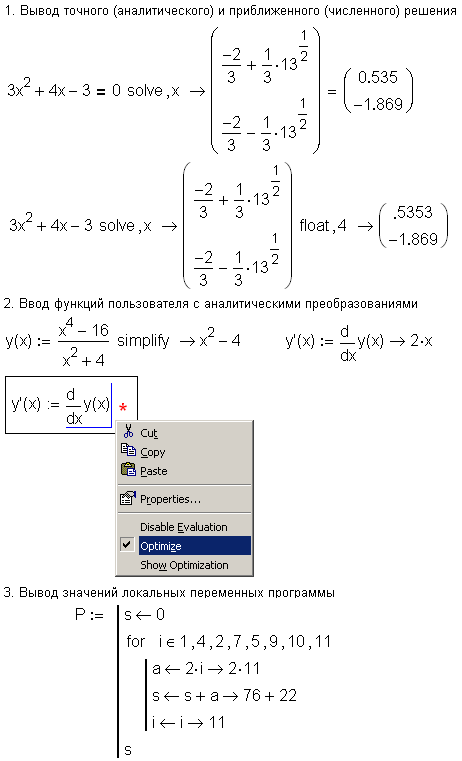 That enables us to insert the user operators into a Mathcad worksheet. Figures 1.28—1.31 show the use of these operators to solve some particular problems. The function mean returns arithmetic mean of arrays (vector, matrix or range). The first call of this function in Fig. 1.28 is made in common form: as a function. Through it two parentheses are appeared (it is like saying salt is salty) that may confuse a novice user. He will try to delete excess parentheses not understanding why it is impossible to do. The way out is to call the “matrix” function (the function whose argument is a matrix) not as a function but as prefix operator, which allows operand without parentheses (see the second operator in Fig. 1.28). Figure 1.29 shows how to redefine built-in factorial operator to have it working with fractional operands. For that we insert the function ! (х) into worksheet being equal to built-in gamma function which argument is shifted to one. We can call this new function in traditional form ! (5.01)= but to call as shown in Fig. 1.29 , as postfix operator, is better. How to insert the symbol ! and other reserved characters into Mathcad worksheet not in the form of operator (in this case, factorial sign) but as a function name is described in sec. 1.2.2. The examples shown in Figures 1.28 and 1.29 are simple and have no practical value. Still, using postfix and prefix operators to work with relative scales of temperatures is very convenient. We will discuss it in sec. 1.4. Fig. 1.30 shows how to insert additional Boolean operator “approximately equals” by means of infix operator into a worksheet. It is very useful in performing iterations (See ch. 6) where loops stop execution by “approximately equals” instead of “not exactly equals to”. Fig. 1.30 shows that p approximately equals to 3.142 but the value 3.14 (which we remember, as a rule) is not “approximately equals” to p.
Fig. 1.31 shows that after we have redefined two-operand built-in operators addition and multiplication the hierarchy of the expression 2 + 2·2 is opened (we discussed it above) by means of the tree operator. One of the causes that Mathcad has become popular is that a user can insert as operators, as functions into a worksheets depending which he may have got accustomed to when learning mathematics in school or in institute. This makes the Mathcad worksheet looks like a paper with calculations made by hand or in a text processor environment (Scientific Word, ChiWriter etc). Nevertheless, our advantages in place can lead to disadvantages in other places. 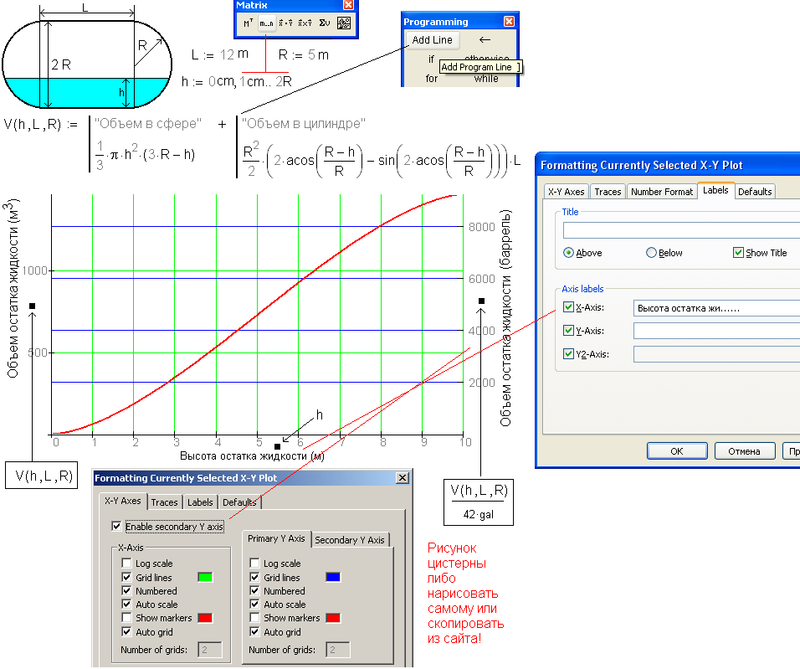 Live Mathcad equations using many-storied operators, instead of text functions, cause difficulties in Mathcad Application Server technology (See Ch. 7). While the names (symbols) of built-in variables, functions, and operators are fixed, we may give any name to a user object. The limitations here are connected, first, with certain traditions (discussed in sec. 1.3), and secondly, with the features of Mathcad itself. Fig. 1.32 shows symbols, Greek letters and special characters from the Mathcad Resources, which we may use in addition to the keyboard characters to name variables, functions, and operators. 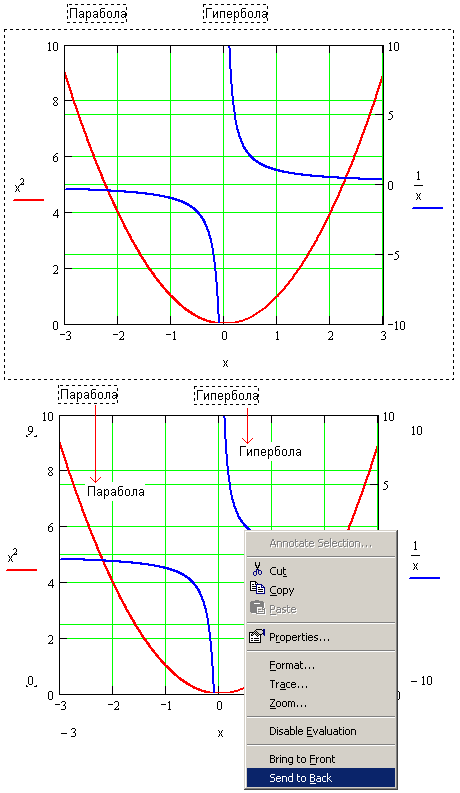 The Greek toolbar also contains two mathematical instruments — constant p and gamma function G.
Combination keystroke <Shift>+<Ctrl>+<k> allows us to insert in variable names first, the symbols prohibited from using in traditional programming (blank, dash, comma, etc), and, secondly, symbols fixed for some operators in Mathcad ($, @, etc). After pressing this combination, the color of pointer changes from blue to red that indicates emergency state of Mathcad. It prevent us from inserting certain operators by fixed symbols, for example the assignment equal sigh by typing <:> (see sec. 1.1). The symbol just will be added to the variable name which has been finished already as we type symbol <:>. To change the pointer color back to blue we should type the symbols <Shift>+<Ctrl>+<k> again. Fig. 1.32 shows that this combination allows us to insert nonstandard but “speaker” variable names: US$, etc. Only one character, which we cannot insert into the variable name (or rather, we can type but cannot see it then), is a period. It divides the name into two parts — name itself and a subscript, for example, typing t.вх we obtain tвх. Nevertheless, we can do that creating a variable with a text subscript, which has an invisible blank as a name before subscript and periods as subscript. For example, in Fig. 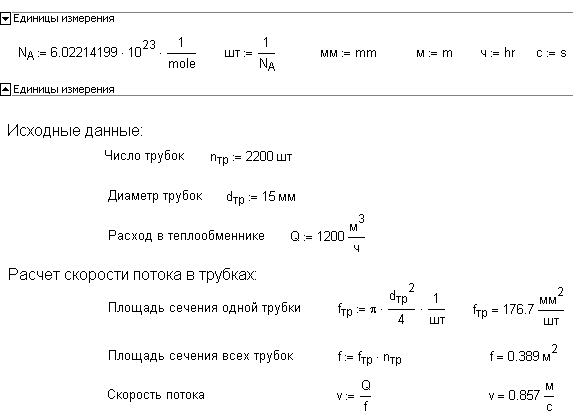 1.4 two periods were inserted into unit of pressure мм рт.ст. and into unit of capacity л.с. (horse-power) in this way — see Mathcad worksheet at http://twt.mpei.ac.ru/MAS/Worksheets/Book_MC_12/1_04_Insert_Unit.mcd. 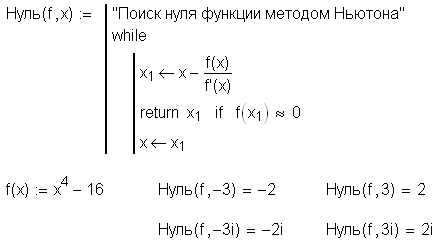 A reader can see a blank (space) in the beginning of the variable name мг-экв/л, shown in Fig. 1.33. This blank is not fortuitous: some characters cannot stand in the beginning of variable names. First of all, that concerns digits 0 through 9. If the variable name consist of one character, which is a digit, that follows to such curious thing 3:=7 7:=3 — the variable named 3 assigned the value equals to 7, and the variable 7 equals to 3, etc. 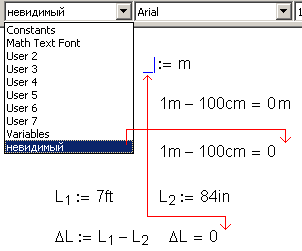 Sometimes (in certain Mathcad versions in combination with certain Windows versions) some letters of Cyrillic alphabet cannot stand in the beginning of a name. Although, that restriction does not apply to a blank. Therefore, it is desirable to start a questionable name with a blank. A blatk or some of it may use as a variable name making it invisible (see sec. 1.2.3). Another way to enter a sophisticated variable name into Mathcad worksheet is by pressing <Shift>+<Ctrl>+<j> (Fig. 1.34). Fig. 1.34 shows how to enter the variable with rather a complicated name H2PO4-(one-valent ion of orthophosphoric acid) that practically consist of three variables: the variable H2 (H.2) multiplied by variable H2 (H.2), which, in turn, raised to power minus – (<Shift>+<Ctrl>+<k>+<->). There is a limitation: such complicated names are enclosed in square brackets. Mathcad 12 has the third key combination <Shift>+<Ctrl>+<n> that enters a system index into the variable name. This index contains one of four key words: mc, unit, user, and doc enclosed in square brackets. System index is the third type of that in the variables. 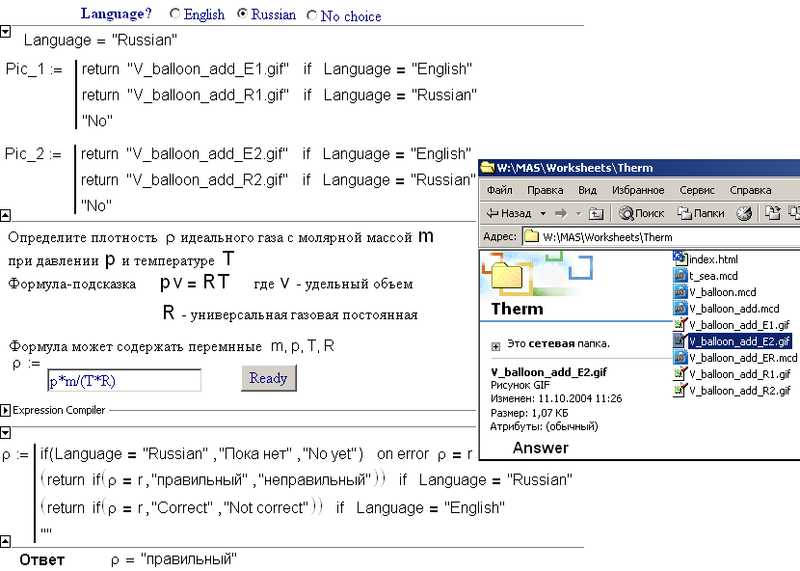 The previous indexes are text (t.вх) and digital (V[i). Fig. 1.35 shows defining (redefining) sin(x)≡sin[mc](x·deg)by the new system index. Mathcad users sometimes need to have the function sine work with degrees but not with radians. In this case, the native Mathcad function is used to omit memory overflow through recursive function calls. There is one more reason to introduce the system index into Mathcad. As we noted before, the worksheet may contain different variables of the same name. This is a typical example beside of those shown above — the conventional mathematical notation f:=f(x): the variable f is assigned the value of function f with the argument value saved as variable x. To avoid errors these two objects must be divided by styles. Although, such Mathcad worksheet is impossible to enter “at sight” in which we cannot see a style of a variable or a function. That is why the notation f:=f[mc](x)is better. Although, that may be worse as the excess information makes a worksheet hard to read and study. Using styles is a kind of coding, encipherment of a worksheet: everything is computed right but is impossible to renew a worksheet. As will be discussed in sec. 1.5, Mathcad worksheet is three-dimensional. That allows us to overlap the variable name by a picture, its graphic pseudonym, and remove the restrictions on the variable names, for example, insert a period of two indexes without across shift (see Fig. 1.34). Fig. 1.36 shows the problem on population growth of wolfs and hares; the pictures of the animals substitute the variable names. It is impossible to use variable names with “pseudonyms” on Mathcad worksheets assigned for further modifying. Those are appropriate in Mathcad worksheets opened on the Web. This section considers an unusual problem: is it possible and expedient to have invisible symbols on the screen? The answer: it is possible and expedient. Moreover, this technique does not hide something from a user but makes a worksheet easier to read. Everybody knows the history of invisible man by Herbert Wells and numerous screenings. Here is a story of invisible variable (constant, function, operator). Its life is possible and in a number of cases is expedient not only in Mathcad and but in other applications. As was noted above Mathcad allows us to change the color of the variable font. White color is a mixture of seven rainbow colors in existence but a color equal in rights and appropriate to paint variables in Mathcad. At that, if a white variable is situated on a white background it becomes invisible. A brief mention about colors in Mathcad worksheets. By default Mathcad user type in black-blue on white: mathematical expressions are black and comments are blue (see sec. 1.3). Besides, by default these two objects have different fonts: mathematical expressions have it san-serif, text — ordinary that allows us to make them out in black-and-white hard copies, for example in prints. 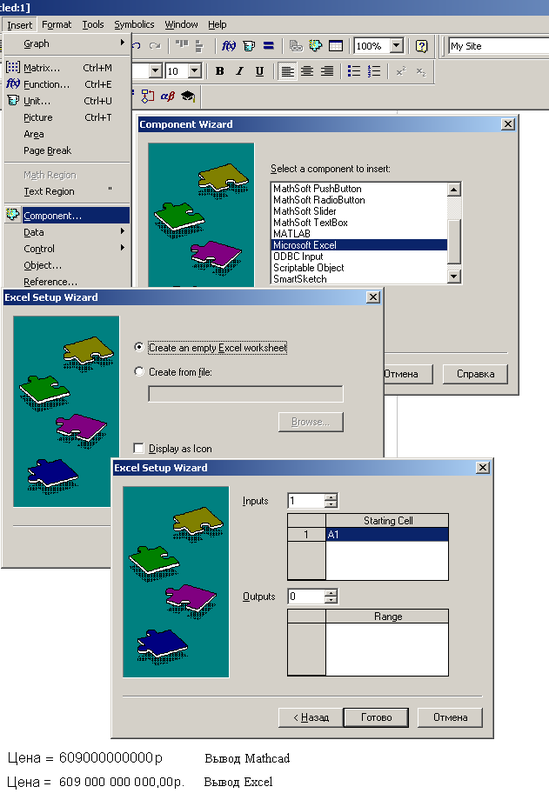 Default choices for font and its color refers to a template, a empty worksheet that we see on the screen when we first open Mathcad or click the button New on the Standard toolbar. The name of the template is normal. When Mathcad executes command New from the File menu it displays the dialog box containing the list of built-in and users templates that differ from the standard (normal) in arrangement and filling. We can create a user template (another name is “Blank Worksheet”) choosing command Save As. The file has extension mct and contains in Templates folder. The background of Mathcad worksheet is white (we type in black-blue on white). A user may change it for green, for example. It is believed that green color is good for vision (green lamp shades, spectacles with green glasses etc). The Herculean displays typing in green on black were widespread ten or fifteen years ago. Moreover, a user may change the background color of some expressions to make them more conspicuous for those who will study a worksheet. Otherwise, one may hide the distinct expressions changing its background from white to black (the invisible expressions: we write in black on black). As we noted before a Mathcad worksheet may contain different objects of the same name through the different styles. This example shows (also see Fig. 1.9) not one but three variables А which save their values equal to 3, 4, and 7. Our example is rather artificial, but real Mathcad worksheets quite often contains two variables А one of which is a user (such variable name is very popular) the second is built-in (А is a unit of current strength). Mathcad is not just a mathematical but mathematical and physical environment. It allows us to assign the variables not abstract values (as in traditional programming) but the value of the physical quantities (mass, time, length, energy). To be able applying both ampere and operator A:= we must assign these variables different styles. To omit the confusions we may change some font characteristics of the variable style: size or color. The color may be white as well. That is a n invisible variable, the hero of our discussion. In the Herbert Wells’s novel, the invisible man became visible when got dressed. We can make visible such variable in whole Mathcad worksheet highlighting some operators or changing the background color of the worksheet. Let us consider the examples that justify using invisible variables and show the benefit of them. The multiplication sign is invisible in last two examples that conform to the tradition existing in mathematics do not place a sing between efficients, if the first is a constant and the second is a variable. For that reason, a variable name cannot start with digits. However, blank space between the two values may mean as addition, as multiplication. For example, 2 hours 30 minutes, 1 kilometer 200 metes etc. Here the invisible addition sign stands between the same quantities (time and length), and multiplication sign — between the constants and the units. Fig. 1.37 shows how to solve it in Mathcad. First two operators in Fig. 1.37 insert the user function named + into a worksheet duplicating the built-in addition operator. We cannot change the style, therefore the color, of built-in addition operator (that is not advisable: we need the “visible” addition), but to change a user function is allowable that was done with the second operator. Mathcad allow us to call a function with two arguments as an infix operator adding up invisibly five feet and twelve inches, “the size of an averaged Englishman”. Fig. 1.37 also shows how to change the name of variable style from User 1 to invisible and the color of the variables to white (see New Style Name in dialog box Equation Format). Besides, the built-in operator of invisible addition for a vulgar fraction is appeared in Mathcad starting from version 2001(Fig. 1.38). We can use it pushing the particular button on the toolbar Calculator before fraction introducing. It is also possible to use the invisible addition in the result inserted by the evaluation equal sign = between the integer part and the fraction after the corresponding formatting (format Fraction, also see Fig. 1.6). Sometimes Mathcad is too pedantic in dimensional quantities. For example, one says that some equipment is situated at a height of twenty meters and another at zero and not specifies the units of that zero (meters, centimeters, feet, or inches etc). 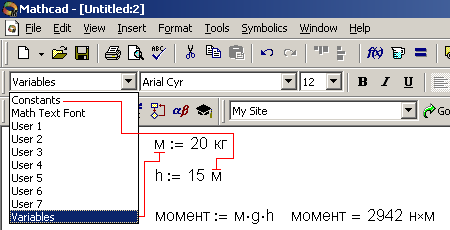 Nevertheless, Mathcad always displays the units of the dimensional values even when it is not necessary. In that case we can hide an excess unit converting it to invisible. Besides, the invisible unit appeared in Mathcad 12. Now the operator 1 m — 100 cm returns 0 but not 0 m in this version. Nevertheless, that technique remains valid. We can use it in approximately zero solution. Mathcad works with decimal, binary, hexadecimal, octal numbers. However, we may need to make Mathcad work with forms more exotic, for example, with Roman numbers. For that we insert the function with the invisible name that returns a Roman number if its argument is an Arabic and conversely the Arabic number if the argument is Roman (Fig. 1.40). Fig. 1.40 shows the invisible function called as postfix or prefix operator which arguments are not in brackets that gives the illusion of Roman arithmetic (see also Fig. 1.28). Only quotation marks weigh down the Roman numbers. Mathcad has powerful instruments to work with vectors and matrixes (arrays). There is one limitation: these arrays should be completely filled. In practice we sometimes meet with nonrectangular matrixes, for example, with triangular. The matrixes may have more complicated form. Thus, in Ch. 4 (See Fig. 4.14) the source data for statistical manipulation form the matrix as arrow pointed upward and to the left. Fig. 1.41 shows how to imitate working with dispersed matrix. The empty elements of the matrix in Fig. 1.41 keep the number that cannot be a matrix element. We do not see it; it was assigned invisible style. Before working with such matrix usually it is turned into a vector eliminating empty elements by the small program that shows Fig. 1.41. Fig. 4.14 shows more complicated program; it turns the matrix into three vectors. Often we display the result of a computation in different units Р=760 mm Hg, Р=1 atm, Р=101.32 kPa etc. It is better to display here only the first variable and put away the rest. That is a good general principle for all documents including Mathcad. If we can put something away, we should do it. 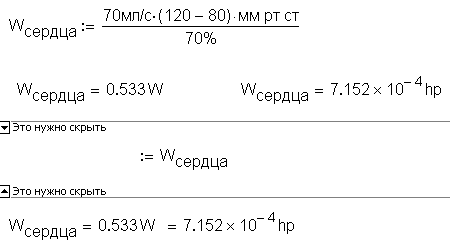 Fig.1.42 shows the extension of the problem about capacity of the human heart which displays the file Wсердца= = in two capacity units, in watts and in horse-power. 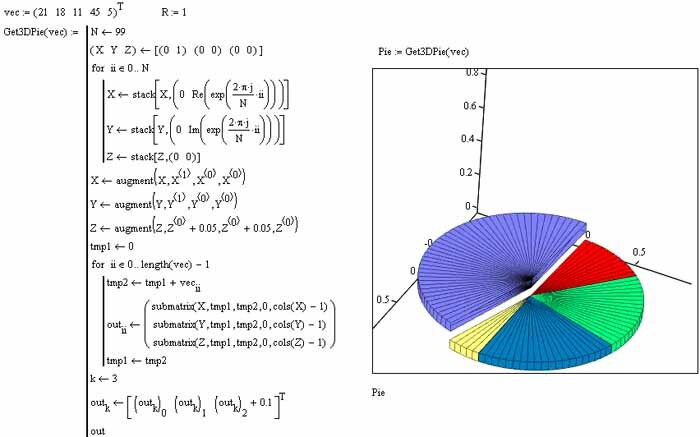 Mathcad provides programming operators for creating for loops and while loops (See Ch. 5). To create until loop or interrupt a loop in the middle we should create an endless loop and insert statements break, continue, or return. To create an endless loop we use “infinite” operand in a while statement. The infinity symbol (it may be any non-zero number) is typed in white on white (Fig. 1.43). We can also insert other invisible symbols into the program, for example, to insert an empty string or to shift an operator to the right for fixation of the cycle nest. It is known that introducing a variable value by the operator := we can display a numerical value by the operator ®. This calculation technique was shown in Fig. 1.11. At that, if all the variables of an expression have their numerical values operator ® displays a result and not the expression. Still, (this is a Mathcad user’s dream) it is desirable to see not only the resulting value of a variable (that easy to do by the operator =) but the values of all variables forming the result (values of variables Re, Pr, and x from the example in Fig. 1.44). Such displaying is useful especially if the operators forming variable values Re, Pr, and x (speaking of Fig. 1.44) are far from the operator forming the variable Nu that is of interest to us. We can display values of the variables Re, Pr, and x but we can also try to separate the resulting numerical value into constituent values by two invisible operators and a ruse that shown in Fig. 1.44. The point is that a variable l was inserted into the computation (it is the narrowest) equals to 1. Then, all the variables in the tandem Nu:=...®... were raised to l degree but previously variable l is lost their numerical value for symbolic conversions (operator l:=l). All the ruses result in that shown in Fig. 1.44. The previous Mathcad worksheets shown as pictures are without any comments, texts or pictures that do not affect to computation but help to understand its essence. Fig. 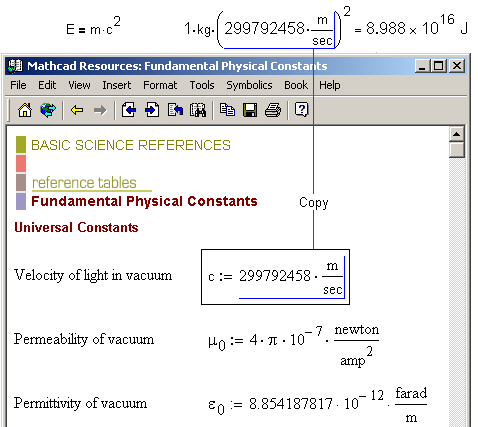 1.5 being an exception shows Mathcad worksheet with fundamental physical constants as an assignment operator (for example, с:=299792458·m/sec) and with text comments to the left Velocity of light in vacuum. Besides, in the left top corner of Fig. 1.5 there is a name of the worksheet and small graphic “adornment”. Many users of Mathcad do not insert the comments to the worksheets thinking that they are created for personal use and elucidative fragments could be inserted later. Often this “later” never occurs: all “non-comments”(mathematical operators) are inserted into the worksheet, it works and gives precise result; there is no time to insert comments, we should go further to develop this worksheet or to create the new one. Still, if the worksheet is intended for personal use some comments in it will not be superfluous. We may tangle even in own worksheet opening it after a time if it have no any comment, for example a name. We can name the operator non-comment if the computation interrupts and displays an error message when it being withdrew from the worksheet. Returning to the point of sec. 1.2 we can contend that the best comments are right, “indicating” names of variables and functions were fixed long ago on the definite quantity in a definite branch of science. It will be enough to name such a worksheet and that will be clear without comments. A name and other data concerning a worksheet (the time of creation etc) can be placed in the heading and the “basement” of a worksheet by the command Header and Footer… from the View menu. 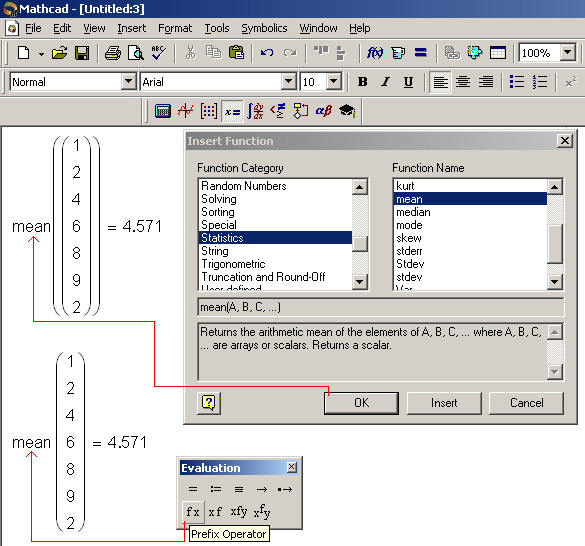 Mathcad 12 provides advanced features to save metadata (information about information). We can transform the pure mathematical operators to the comments clicking on it with the right mouse button and selecting Enable/Disable Calculation from pop-up menu (Fig. 1.45). The indicator that a mathematical operator is turned off the computation is a black rectangle upward and to the right of it. We can disable operators to transform it to a comment and, for example, to select the formulas for calculation from the list available or to speed up computation. For example, a three-dimensional plot can be disabled in checkout and be enabled again in ready worksheet. If one function is defined twice its first definition can be considered the comment under the certain conditions. There are Mathcad worksheets containing whole pages that are the comments as a matter of fact. 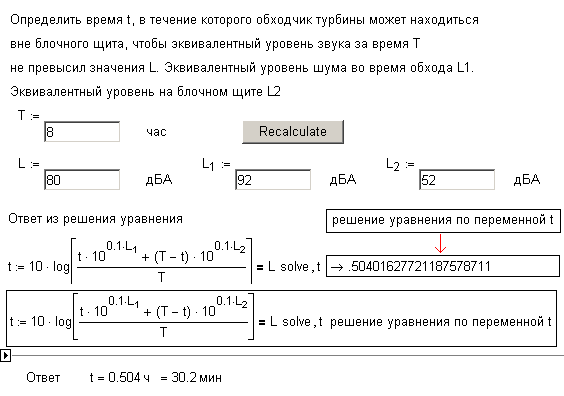 The developer of such worksheet suggests users to study the calculation, after that insert their data, and make computation. In principle, here the operator ≡ should work which definitions applies above it (global definition) but it inaccessible in Controls (see Fig. 1.13) and in Web Controls (see Fig. 1.14) being used more often to design an interface. Therefore, we ought to type again (duplicate) calculation operators after inserting the source data and hide this area as shown in Fig. 1.22, for example. Another way to transform the assignment operator to comment is to substitute = for := (Boolean equals, but not the equal sign for evaluation): c=a+b2 for с:=a+b2. This is a general way to insert the comments. We type several symbols that is a name of a variable or a function by default but it transformed into a text after pressing a blank Thus the fact is marked that blanks can be in comments only but not in the names of variables or functions. Pushing the button <"> (quotation marks) before inserting a comment or choosing Text from Insert menu we create a text right away. If the new comment is practically similar to a previous, we should copy the old one and edit it. We know from sec. 1.2 that the names of variables can contain blanks and other reserved characters inserted by keystroke <Shift>+<Ctrl>+<K>. In this case, we can include any symbol allowed in comments except for the period, which is known to turn to invisible and indicate the beginning of literal subscript. The pictures are very informative in Mathcad worksheets. We create a picture elucidating the calculation in graphic applications (in Paint included into Windows) or scan it from a book and insert it as part of one object of Windows application to another. Often Mathcad includes the SmartSketch application that works with vector graphics but not with bitmapped one. 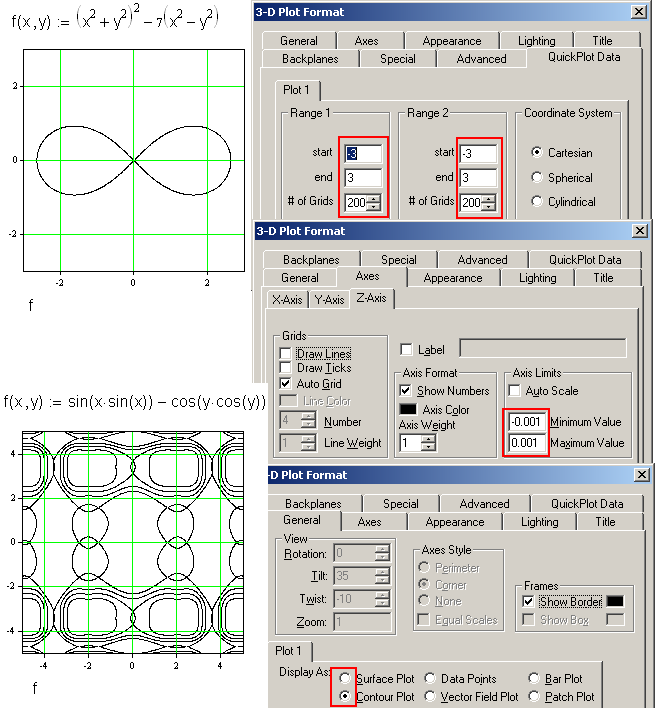 In addition, Mathcad can exchange data with applications such as AutoCAD. If we double-click this picture in Mathcad, causing in-place activation of the originating application we can edit it, for example, in Paint and return to Mathcad (Fig. 1.46). We can insert parts of Mathcad worksheet itself into the picture “freezing” (button <PrintScreen>) it and transferring the “freezing” to graphic application. For example, by this way we can transfer names of some variables from Mathcad worksheet without changing their fonts and other attributes. We can insert the picture both manually and automatically selecting Picture from Matrix toolbar — see Fig. 1.47. Fig. 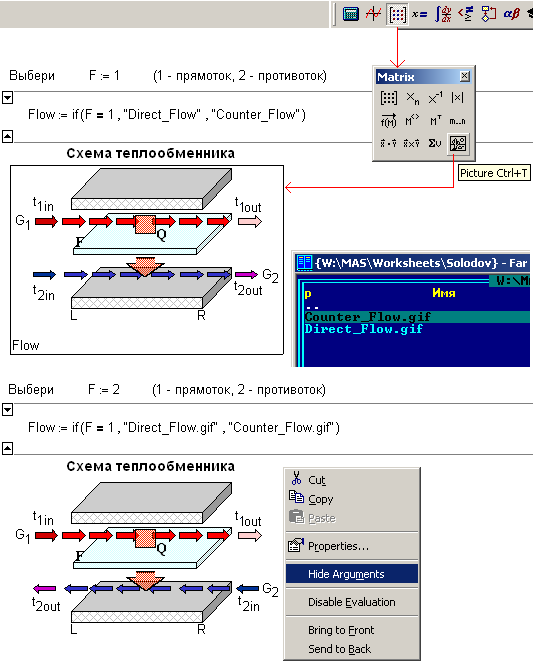 1.47 shows the Mathcad worksheet where variable F is assigned the value 1 or 2 (not 1) which change the value of variable Flow from Direct_Flow to Counter_Flow following the scheme displaying of cocurrent or counterflow heat exchange. 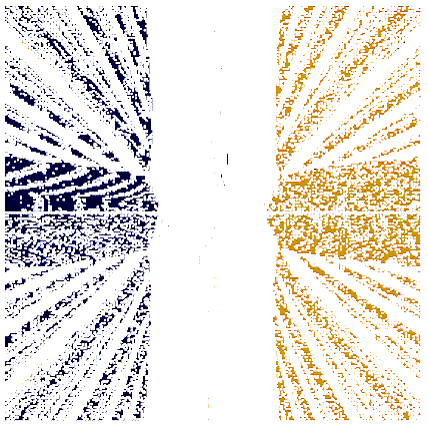 These two pictures made in advance in the graphic application (Paint) were saved as Direct_Flow.gif and Counter_Flow.gif. Fig 1.47 shows “edge” of screen displaying two image files in File Manager “FAR” (the analogue of Norton Commander). To change the pictures in Mathcad worksheet according to the way of calculation is a very useful technique (one may say change of decor). That allows us, for example, to change from Russian into English, modify a set of visible formulas of calculation, etc (See Ch. 7). “Change of decor” may imply change of the languages. Thus, Fig. 1.48 shows the content of the hidden operators that display the correspondent text according to the chosen language (choose defined switch). The texts are saved as separate image files. See the Internet version of the file at http://twt.mpei.ac.ru/MAS/Worksheets/Therm/V_balloon_add_ER.mcd. Fig. 1.48 shows part of a screen with Explorer containing these four image files. Although we will return to texts that are the lion's share of comments. Mathcad has the spell-checking but for English texts only. For that reason to create texts in Mathcad, it is better to type that in Word or insert Word itself into Mathcad worksheet as shown in Fig. 1.49. Fig. 1.49 also shows new Language tab available in Mathcad 12. We can change not only spell check language via it (clicking Spell Check Options) but language in menus and dialog boxes (top scrolling list Menus and dialogs) and also some mathematical expressions (top scrolling list Math language). Earlier versions (Mathcad 8-11) have only British and American dialects in spell checking. 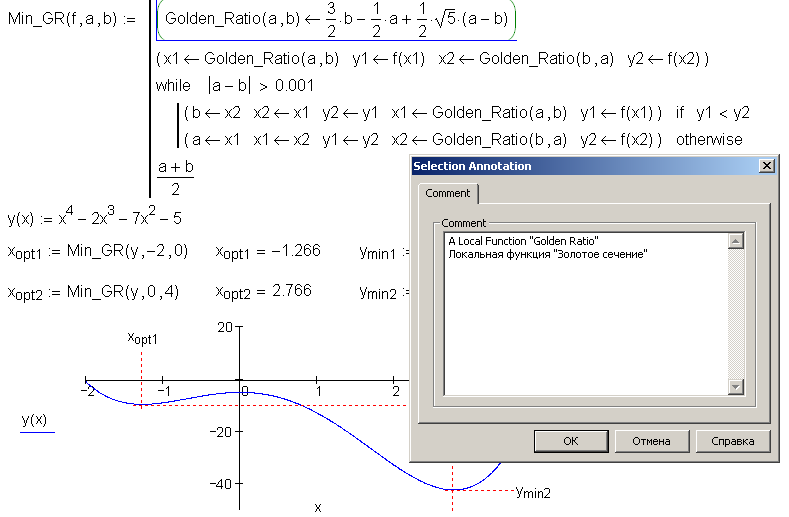 Mathcad 12 enables us to comment separate operators via View | Edit Annotation... from pop-up menu clicking on it with the right mouse button (Fig. 1.50). The operator having such a comment is distinguished by additional brackets appeared when we move a pointer to it. Besides, we can recall Excel allowing us to comment the table cell. The sign of a comment is a corner in the left top of a cell. We can attach more sophisticated “comment” information in Mathcad 12 via command Properties from File menu (Fig. 1.51). Such information about the file (metadata) can be necessary to distribute in Internet with technology Mathcad Application Server (See Ch. 7). Such information helps browsers to find this file (cite) in Internet. In the beginning of this chapter, we noted that Mathcad is not just mathematical application but physical and mathematical (see Fig. 1.4 and 1.5). Frequently, the real “physical” calculation, i.e. that where almost all values have units (mass, length, force, etc. 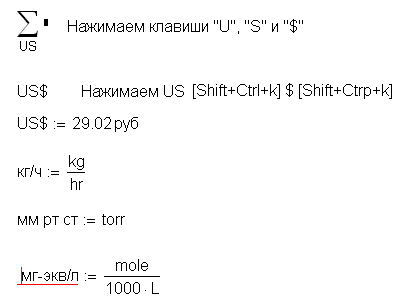 ), have units not as a multiplier, simplifying and allowing us to avoid some errors, but as a comment of the kind: enter pressure value in atm Р:=120 instead of more convenient enter pressure value Р:=120 atm. Chapter 7 tells how to simplify and automatize the unit choice from the offered list by interface elements Controls and Web Controls changing the operators of the type variable = quantity·unit to more convenient. What are the reasons of imperfect using the Mathcad capabilities? 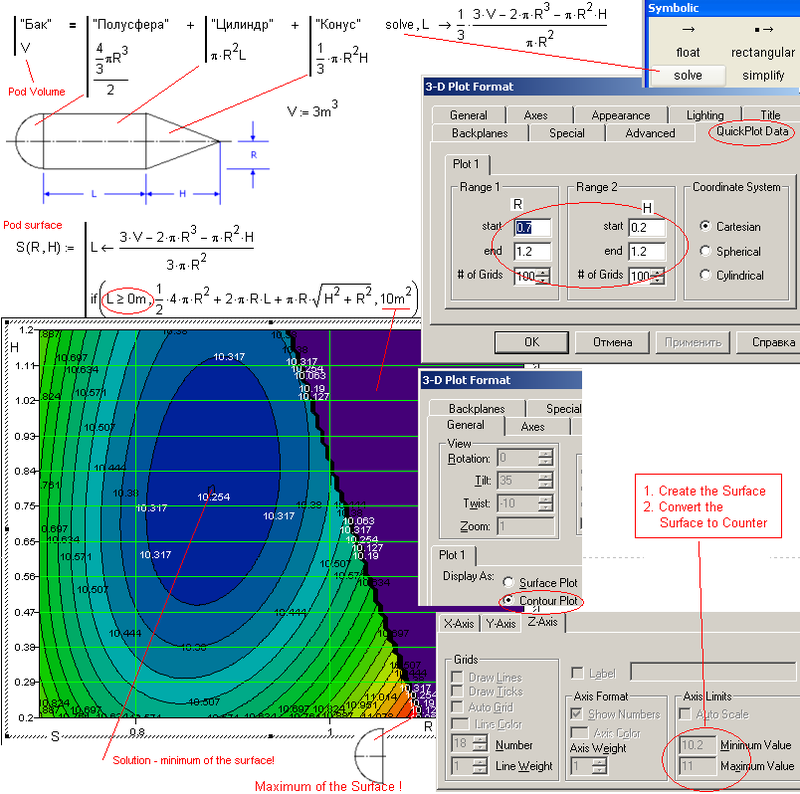 The first one is, of course, that some users do not know about such useful Mathcad tool as built-in constants of physical quantities and use techniques in Mathcad, in physical and mathematical program, formed by “non-physical” languages or by electronic worksheets where the variables keep only numerical values and units are noted in comments even not always. The tool of units in Mathcad is rather simple. We just type a variable consisting of a number followed by a unit name, user or built-in. 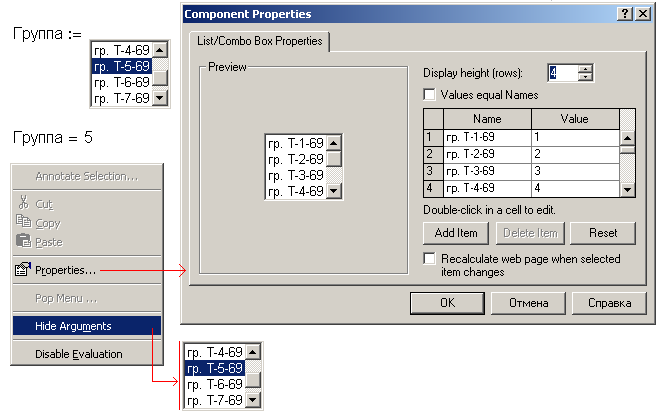 We type the unit or insert it from Insert Unit dialog box shown in Fig. 1.52. If we type the unit name, Mathcad writes multiplication sigh, visible or invisible, between value and unit. The form of this sign (point, cross) can be changed. Fig. 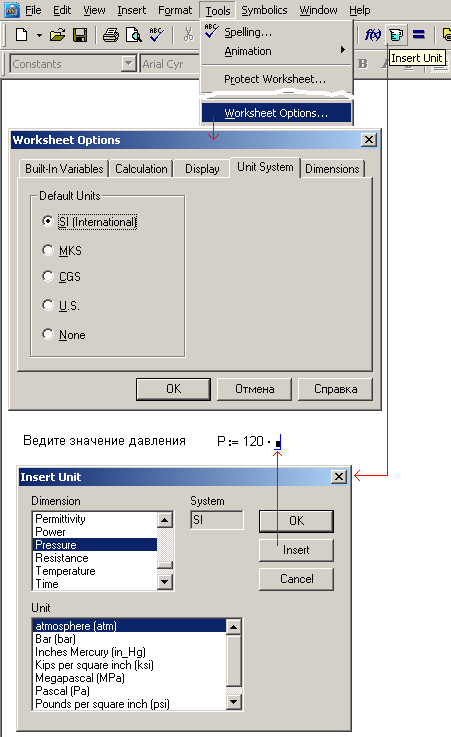 1.52 shows Unit System tab from Worksheet Options dialog box with SI unit system set by default. 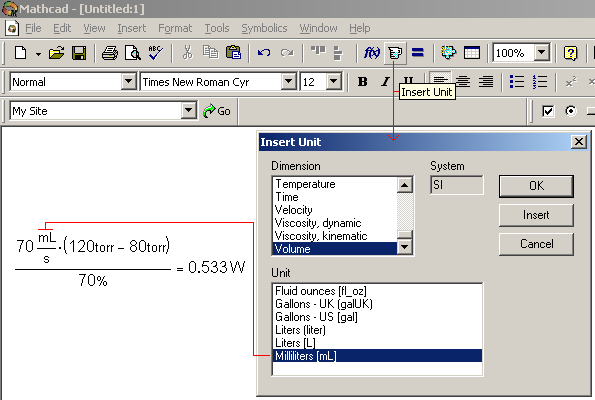 Mathcad checks calculations for dimensional consistency: we cannot add meters and kilograms. That allows us to avoid errors and misprints in formulas, for example, wrong power or addition sign instead of multiplication. Dimensional checking is disabled in plotting (see sec. 1.6). Displaying dimensional value by operator = we can insert another unit into the third operand (into the third rectangle appeared when we hold the pointer over operator) to obtain required result or, rather, to change a unit by default to another. We can also duplicate dimensional value with different units to give a choice for a reader: joule and calorie, atmosphere and megapascal, etc (for example, capacity of human heard expressed in watt and in horse-power). What cause the skilled users to keep of units or seize that from almost finished worksheets? 1. Some Mathcad tools are not adapt for working with dimensional values. They are interrupted with the error message “Can’t have anything with units and dimensions here” (finance functions or functions working with splines) or return wrong answer (function line). In that case, we should take off the dimension dividing the variables to correspondent basic units and then return required units multiplying it by the value. Such examples (temporary, not complete disabling unit tool) you can find in Ch. 4 (See Fig. 4.3). If the work with dimensional values is not planned, unit tool should be enabled via command Tools | Worksheet Options... and switch None in Unit System tab. Otherwise, unit tool may result in errors. For example, a user forgot to define a variable that has the similar name with a unit; nevertheless, the calculation is not interrupted. Here is incomplete list of such “crafty” variables: A, K, T, S, R, m, L, s, etc. Another example. A user defines a function and wants to represent it as QuickPlot, i.e. without defining a range variable previously, for example m:=–3, –2.9.. 5. In result, a plot is not displayed or, rather only one invisible point is represented because variable m keeps the length unit – meter. 2. Mathcad symbol mathematics work with units as with variables neglecting that one meter amounts hundred centimeters or sixty minutes are in a hour, etc. Symbol mathematics is foreign element in Mathcad; it was taken from Maple where unit appeared in the eighth version. Although, symbol mathematics is auxiliary tool in Mathcad integrated seldom into a calculation but operates auxiliary functions. If it is necessary to have units worked in symbol mathematics we should make efforts: enter to Mathcad via operator substitute that 1 m=100 cm, 1 hr=60 min, etc. 3. Mathcad arrays contain only dimensionless quantities or the quantities having the same unit, i.e. the same quantities, time, force, mass, etc. Only one exception from this rule is known. Function Find returns a vector of values with different units if its arguments have different units. If it is necessary the function created by program to return several values with different units in one vector or matrix we may take them off and later return them back (for details see Ch. 5). 4. Sometimes we have to use so-called empirical formulas connecting not just quantities but quantities in the appointed units. In that case we should also take steps similar to that described in point 1 to avoid fails in unit use. As example, Fig. 1.53 shows the calculation of a secondhand car cost depending on its age and run. The way in which the formula of car cost was obtained is discussed in Ch. 4. Now this example shows how the similar formulas can be enlarged to make unit tool of Mathcad work in them. Introducing the empirical formulas, we always clearly define the units for source data and dimension of the result. In that case, car age should be expressed in years and run –in miles. The formula returns cost in US dollars. These units should be added to the formula and we must disable unit tool temporary (see point 1) in it. 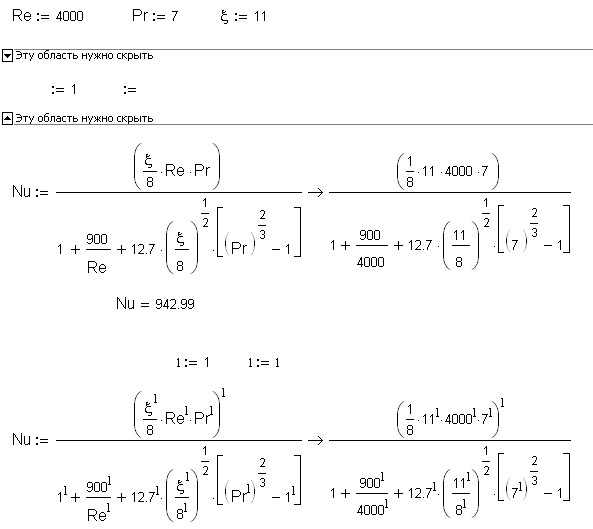 We did it when we redefine the function Цена(Возраст, Пробег):=...dividing the arguments to their units and the function itself was multiplied by required unit as shown in Fig. 1.53. 5. Mathcad list of units includes not all physical and other quantities that we have to deal with. For example, there is no units of information (bit, byte), units of cost (dollar, ruble, euro, etc) can be necessary on calculations. Mathcad works only with “The magnificent seven” of SI (length, time, mass, current, temperature, illuminosity, and substance) and with their combinations (force, power, energy, etc). What we have can do in Mathcad to make technological and economic calculations dealing with dollar, ruble, euro, etc? Fig. 1.53 shows one of techniques. Dollar ($US) is assigned a unit which is not used in this calculation, and generally rarely used in calculations, for example, candela $US:=сd. Then we can attach other currencies to dollar, for example руб:=$US/29.After that the cost will be displayed in candela (see Fig. 1.53) which we should replace with the required unit (pseudo-unit) of the cost. 6. We sometimes meet formulas purely physical in essence and empiric in their form (see point 5). Fig. 1.54 shows the example of working out such formula in the following problem: it is given an efficiency of a power station (h) and we shall find consumption of equivalent fuel (bут) for power output. 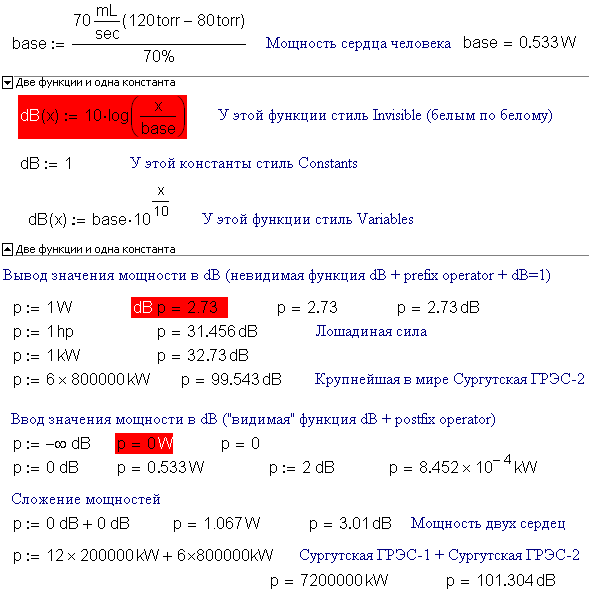 All courses give the formula for such calculation: bут=12300/h where (h) should be expressed in percents and result (bут) will be in grammes per kilowatt-hour. An example: 12300/32=384.4 —power station having efficiency 32% burns 384.4 g og equivalent fuel to produce 1kilowatt-hour of energy. If the appropriate units are listed in the comments, we can have this formula works correctly by the method described in point 4. Although there is another way -- such pseudo empiric formulas were derived to free us from additional calculations connected with units. At that, if the coefficients obtained are easy to memorize, as in our case – one, two, three, and two zeros, such simplified formula settles down in the courses. 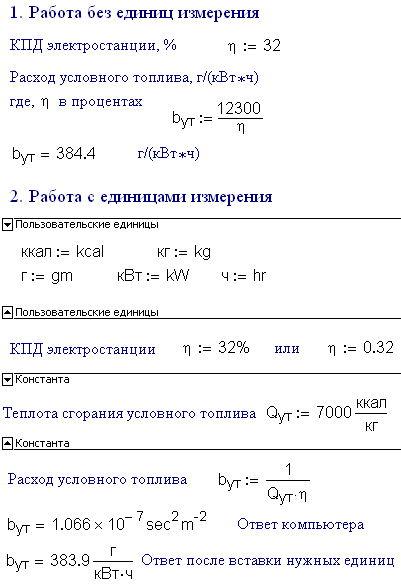 Source formula for calculation of equivalent fuel consumption is: bут=1/(h·Qут), where Qут is heat of combustion of equivalent fuel, the accepted value of it amounts 7000 kkal/kg (easy to remember too). If we insert this formula, but not simplified, work of Mathcad unit tool will not be disturbed (see Fig. 1.54 at the bottom). 7. Mathcad uses only absolute scale for units. Particularly, that means if the quantity equals to zero we need not to assign a unit. Nevertheless, we should do it in Mathcad, for example, l:=0 m, for proper work of dimensional checking. Although, there are relative scales too. For example, we measure temperature in centigrade degrees (relative scale) but not in Kelvin (absolute scale). Particulary, that mean the expression t:=25 °C contains not the multiplication sign between numerical constant 25 and unit °C but something else masked by blank. Fig. 1.55 shows one of solutions of relative scales basing on a simple problem. It is given the input temperature t1 of a certain heater and difference of temperatures in input and output Δt. We should find the output temperature t2. The problem is clear to be not arithmetical but metrological. To solve it we insert three objects named C: the function named C and two constants of the same name, the first (°C:=1) has style (°C:=1), the second (°C:=K) has style (°C:=K) and also we insert function with invisible name (t):=(T/K-273.15) (see sec. 1.2.3). There is not “degree” sign in the keyboard. 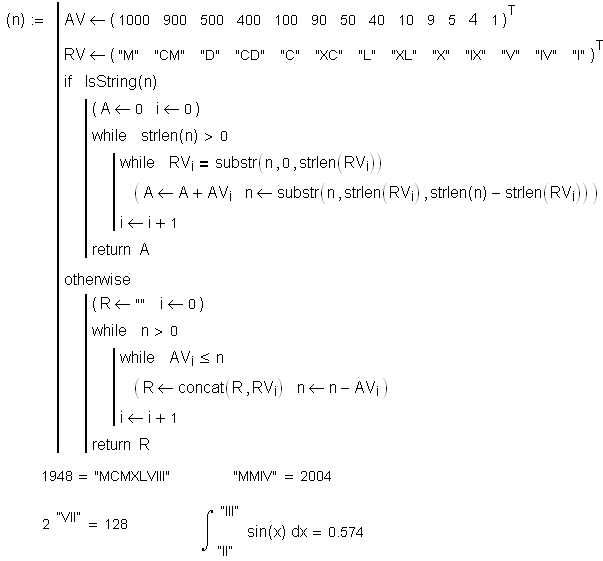 It is inserted by keystroke <Alt>+0176 or by coping from Mathcad set of mathematical symbols. All objects are of the same name C but they are different having different styles (see sec. 1.2). Working with temperature expressed on the relative scale three situations occur. The functions and constants described above help to solve these problems. r Situation 1. We need to insert temperature value in centigrade degrees. For that, function °C with style Variables is called (the first object named °C) as the postfix operator in the right part of assignment operator := -- t1:=120 °C. At that, we assign temperature value on the absolute scale to the variable t1. r Situation 2. We need to insert temperature difference. Here we can use common Mathcad rule and multiply the value by the unit K or °C equal to K (the second object named °C). r Situation 3. We need to display temperature value in centigrade degrees. For that, we should turn the variable into operand of the prefix operator with invisible name in the left part of operator :=. At that, if we multiply displayed value by the constant °C equal to 1 (the third object named °C) we will get illusion that temperature is represented on relative scale t2=132 °C. Three techniques and three objects of the same name described above allow us to work with temperatures: insert temperature value on any scale, display temperature value, insert and display temperature difference. At that we should apply simple but important rule: inserting and displaying temperatures in any scales use only absolute scale, Kelvin, in computing. Mathcad worksheet with temperature conversion on different scales is accessible at http://twt.mpei.ac.ru/mas/worksheets/Temperature_Recalc.mcd. Two functions and one constant are introduced in Mathcad to work with decibels. Their names are the same, dB; name of one function is invisible written in white on white. These objects are different because their styles are different. The invisible function is used to display the value in decibels and that visible to insert. As with temperature, it is called as postfix operator: not p:=dB(0) but p:=0 dB that imitates dimension. Working decibels (bels, nepers) the base (source value) is indicated sometimes too; thus, p:=100 dB (re 0.533 W) where re is the initial letters of reference. Such way of working with decibels requires not prefix but infix operator shown in Fig. 1.57. This technique does not work in Mathcad 12 because some changes were made in the on error operator. We can note some difficulties in using so-called dimensionless physical values: plane and solid angles, mass, mole, and inclusion volume fractions, etc. These problems occur in Mathcad too: in version 12 steradian has become dimensionless (sr=1), earlier it had dimension (sr=1 sr). On the one hand, the developers restore logic by that: radian (the ratio of two lengths) was dimensionless earlier while steradian (the ration of two areas) had the dimension. On the other hand, that clears the way for some errors of the kind: radians and steradians addition, sine of steradian, etc. We can face with the problem of lack of dimension checking working with other “dimensionless” quantities that have different dimensions. While we cannot add mass and moles, addition of mole and mass fractions will not result in a error message. The dimensionless value, item, is often met in calculations. As a rule, it is inserted into the worksheet as it=1 and then work with it in the known way: Number of tubes in heat exchanger N:=2200 it, for example. At that, the variable N remains dimensionless. Although, we can remind that Mathcad keeps built-in unit for items (base units) – that is mole. Mole divided by Avogadro constant is item which could be used in calculations. Fig. 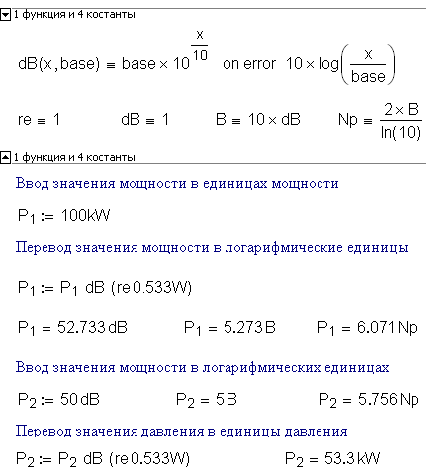 1.58 shows finding velocity of water in a certain heat exchanger; the tubes number (nтр), interior diameter (dтр), and volume consumption of water (Q) are known. Dimensional items and other quantities with “dimensionless units” seem to be just curious things. Thus, in a calculation shown in Fig. 1.58 cross-section area of one tube and total area of all tubes have, strange as it may seem, different dimensions: mm2/it and mm2and they cannot be added. That is right – such operation can be done only by mistake. The example shown in Fig. 1.58 is strained, of course. 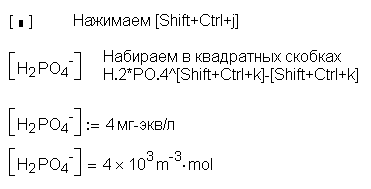 Nevertheless, the author knows real example when the mistake in sophisticated technical and economical calculation was found only after the heading operators руб:=cd and шт:=mole were substituted for руб:=1 and шт:=1. It turn out, that in wrong calculation two quantities were added with dimensions руб and шт. We sometimes ought to have two variables with different dimensions for one quantity. That is, for example, the temperature in thermodynamic calculations where variable t assigns centigrade degrees and T – Kelvin. Mathcad unit tool allow us to avoid this bisection. 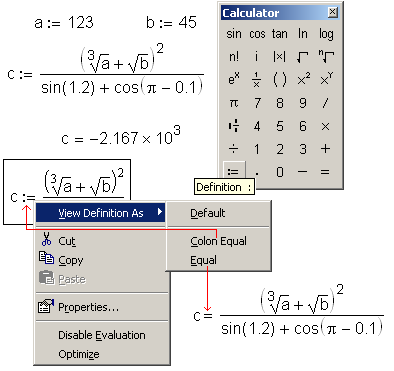 When the author sees a student’s calculation of a “physical” problem made in Mathcad without units it resembles to him situation when one makes calculations in Word: types formulas there and calculates manually, on Windows calculator (see Fig. 1.2) or often on the single one lying not far from computer keyboard. On the other hand, a reader can see in Ch. 5 two particularly “physical” problems with meters, kilograms, seconds (Fig. 5.14 and 5.16); one of which has no units (Fig. 5.14) and another contains units only to display results (Fig. 5.16) because the main function of these calculation odesolve does not work with dimension arguments. That occurs in Maple too that can work with units to starting from version seven but its feature is not global. Therefore, the programs and users should meet half-way to return completely dimensions into the calculations. As was noted in sec. 1.1 Mathcad has one special feature standing out from other applications. Mathcad worksheets are “three-dimensional”: beside the coordinate axes above/below (let us call it x-axis) and right/left (y-axis) there is the third one: close/farther (z-axis). In Mathcad, it is possible to overlap two objects and select which will be in front of another. Fig. 1.59 shows the situation where the texts Гипербола and Парабола are overlapped the plot and indicate correspondent lines. 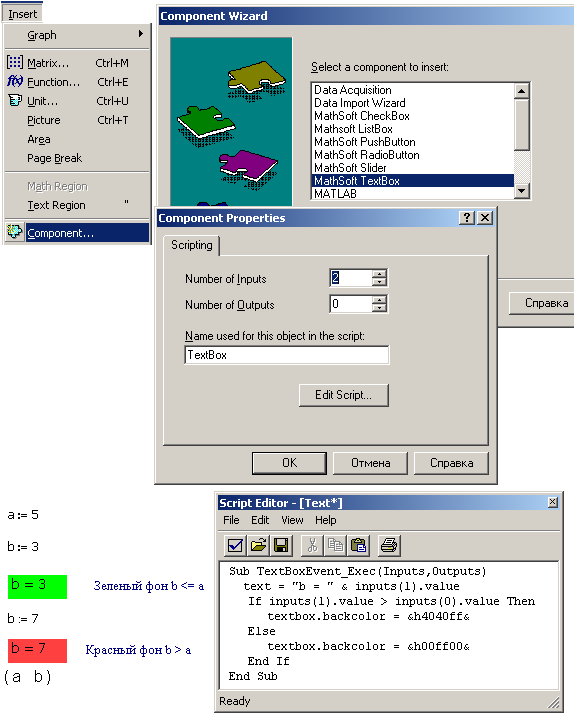 The features indicating the third dimension of Mathcad worksheet are two additional commands, Bring to Front and Send to Back, from pop-up menu. Choosing a command from the menu, we can move an object. Appeared in version 2000 of Mathcad the third dimension became widely used right away. Mathcad adopted this feature from Word and Excel that enable objects overlapping too. The example shown in Fig. 1.59 (inscriptions on the plots) is the most widespread. The inscriptions on the plots can be made transparent if needed, not in Mathcad but in Paint, for example, if we insert it there to redesign (see sec. 1.6). Here are two examples less known to Mathcad users. Fig. 1.60 shows Mathcad function created by a program Min_GR that returns coordinate of the point x, the minimum of another (analyzed) function dividing the segment in golden ratio. It is known that Mathcad programming tool have no instruments to make comments in programs and it did not enable us to have a local function there until version twelve. Nevertheless, Fig. 1.60 shows us comments: texts with different fonts, Mathcad operators (a/b=b/(a+b)), and also a picture that is an exotic object for comments in program. Besides, the program contains subroutine Golden_Ratio that has all features of a local function although the worksheet was created in Mathcad 11 in which the local functions are impossible. What is the matter? The matter is that all these objects (texts, pictures, operators and even working function Golden_Ratio ) were placed on function Min_GR that gives an illusion of a single well commented program. To make the function Golden_Ratio visible within function Min_GR we should use operator ≡ but not := which sigh is replaced by =. The third dimension can be used to hide some information in Mathcad worksheet. There is a well-known literature rule, and the author of this book tries to follow it, to omit a word, a sentence, a paragraph, a chapter if it is possible to do. In informational technologies this principle (its motto is known:”Brevity is the soul of wit”) results in demand to omit unnecessary, overhead information that prevent to read and understand the electronic document probably more than absence of the comments. Such unnecessary information is hidden in close areas of the Mathcad worksheets or moved over the right border of a screen. If it is impossible to do, we can overlap this information by additional or neutral comment as shown in Fig. 1.61. Fig. 1.62 shows the way in which four operators alighted horizontally can be realighted in z-direction, axis perpendicular the display plane. One of the most effective methods to represent source, temporary, and obtained data is plotting. To continue comparing Excel and Mathcad started in this chapter, we may say that the first application possesses business plotting and the second – that scientific. 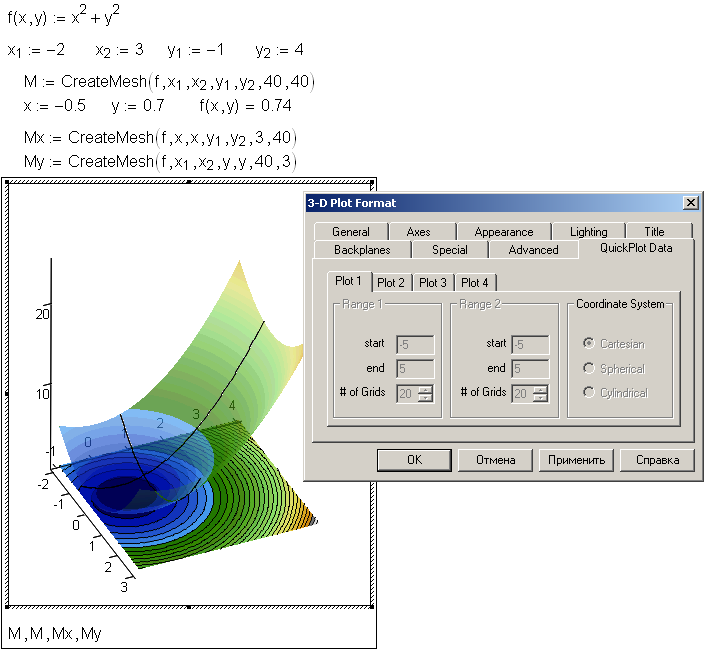 r Three-dimensional plots (3D): Surface Plot, 3D Bar Plot, and 3D Scatter Plot. 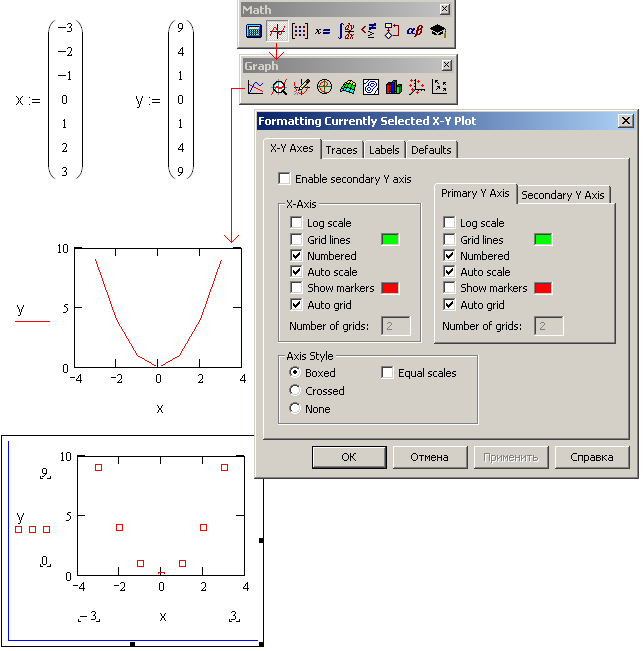 r 3-D plots: Surface Plot, 3D Bar Plot, 3D Scatter Plot, Counter Plot, and Vector Field Plot. There are more plot types then noted above where we listed practically the buttons on the plotting toolbar (see Fig. 1.63) rather than types of plots. Some plots, which could be considered as independent group(2-D Bar plot of graph of errors), are displayed by correspondent formatting of the others, X-Y Plot. We should note that 3-D plots are rather promotional thing than a method to represent results of large calculations, having practical aims not presentation or advertising, especially, if we should print such plot where we cannot rotate it to see from another point. We can rotate 3-D plots by specifying coordinates, changing values of three numbers in the dialog box or with the mouse. If the mouse has a center wheel we can rotate the wheel to zoom in or out of a three-dimensional plot. Therefore, considering screen and paper of printer to be flat, we should prefer simple 2-D dimensional plots creating Mathcad worksheets. Real sophisticated problems may base on set of functions with three, four, and five arguments which plots we must represent correspondently in three-, four-, and five-dimensional space. We should remember that complicated plots often hide rather trivial calculation that masks itself with perspective, lightning, fog and other options. Complicated calculation, having practical value, as a rule, is illustrated with simple, plane plots, which represent the basic law of calculation. Such calculations include set of curves, for example, instead of surfaces looking agreeably but hard in work. The most commonly used plot on Mathcad worksheets is X-Y Plot. It represents location of a couple of elements (components) of two, three and more vectors in the plane, tabulation of functional dependences of one argument. Fig. 1.63 shows that two vector of equal size, x and y, were inserted, then a pointer was moved to blank space where the graph to be appears, the button X-Y Plot was pushed (or <Shift>+<2>, or <@> was typed). Variables x and y were placed in the appeared blank X-Y Plot (we can also insert there vectors themselves). After that simple manipulations (vectors x and y also can be read from the disk or obtained in a calculation, not just inserted manually) Mathcad represent a plot having a set of defaults. In particular, the points of the plot representing the location of the couple of vector elements are connected with a broken line starting from the first point (the first elements of vectors) to the last one (the last elements of vectors). We can change the default settings via the dialog box Formatting Currently Selected X-Y Plot. 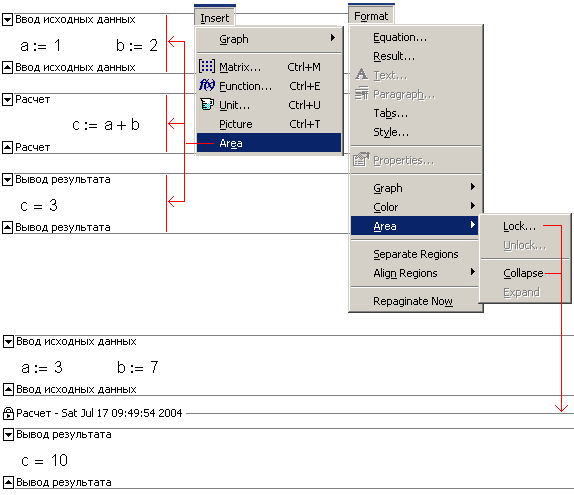 It is called, as the other dialog boxes for formatting Mathcad objects, with mouse double-click the graph. r change of the marker color, four dotted lines (two horizontal and two vertical) by which we can indicate special points in a plot, minimums, maximums etc. r adding legends in plots, in one of four spare corners of a plot (and not just below as in earlier versions) that makes a plot more compact. Cartesian plots can represent both couple of vectors and functional dependence themselves. For that, it is enough to press X-Y Plot and fill in the placeholders of a blank X-Y plot with the function defined above y(x) and its argument х, as shown in Fig. 1.63 but not the names of vectors. After moving a pointer the plot will be produced over a domain from -10 to 10 if the correspondent function returns real numbers in this range. For example, square root of x will be represented within the range from 0 to 10 because it returns imaginary numbers in the left part of x-axis. At that, the problem comes to plotting of two vectors again: Mathcad divides the segment of plot to points, the number of which depends on plot size on the screen (on average it is 50) and on monitor definition, and computes the values of an argument and a function in these points, i.e. forms two vectors to plot them. A user can resize a plot holding the mouse button down and dragging the mouse. Up to version 7, a user had to format a plot before creating: range of the argument, number of points on the plot, to define range variable, for example х:=-10, -9.9... 10. In the last versions (from 7 and older) it is needless to do it creating a Quickplot. Although, we have to format plots manually to represent, for example, two functions in the different ranges of the variable, as shown in Fig. 1.64. The example in the bottom of Fig. 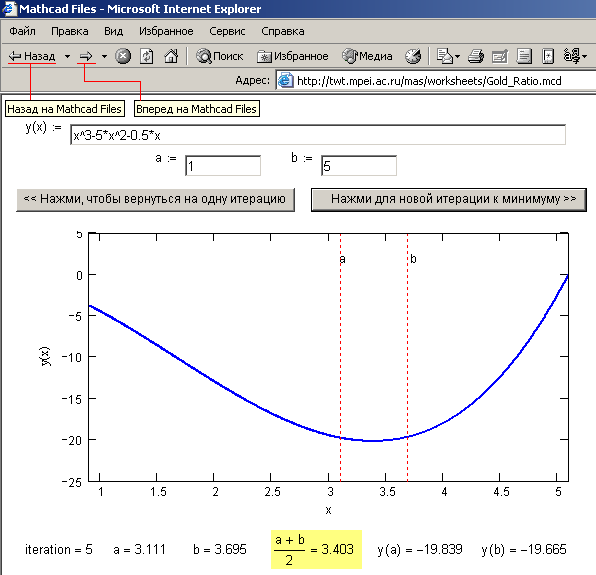 1.64 shown displayed values of the variable х1 and function y1(x1) indicates that Mathcad draws plots point by point but not as we studied in schools and institutes: first, find the critical points (zeros, maximums, minimums, points of inflection) and then draw a qualitative plot. 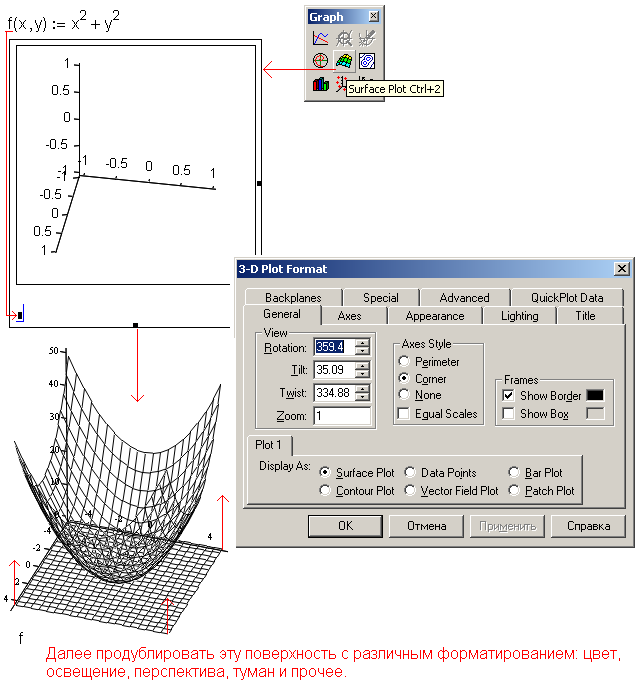 We should remember about it creating plots in Mathcad. The surfaces discussed below are created via the tabulation of a function of two variables now. Then the correspondent grid of a matrix are risen at height proportional to the values of function f(x,y) in the point (Fig. 1.65). After that, Mathcad formats this node in the following way: fills its cells with the different colors over the various schemes, removes the grid, etc. Number of defaults of 3D plots (additional tools of formatting) is a dozen higher than that of 2D plots. Fig. 1.66 and 1.67 show the “graph” novelty of Mathcad 12: the second axis y of 2D plot in the example of finding the volume (V) and square of the liquid surface (S) contacting with air in the tank, contained from a cylinder and two half-spheres, by maximum depth of a liquid (h). The second axis y allows us to estimate the volume of the rest of a liquid both in м3 (the left axis) and in barrels (the right axis). Then the question arises concerning the second x-axis to represent the height of the liquid layer h (the argument of function V) in an alternative unit, not in meters (the first x-axis) but in feet, for example. Fig. 1.67 shows the plot in which different y-axis represent different physical quantities: the volume of the liquid layer and the square of its surface. We may say that the essence the second y-axis is the second grid of y-axis (see Fig. 1.66 and 1.67). Earlier we could represent two and more functions with single y-axis (up to sixteen) too (see Fig. 1.64). Besides, we should remember of such a case. Here is a typical situation in mathematical analysis: two plots are created in one coordinate system, a function and its derivative. That could be considered as an error, which Mathcad is to interrupt with such error message when meters are added with kilograms. In addition, we can remind a problem from the book for intrants: find the values of x of the given function in which this function is higher than its derivative. For the reason that we cannot compare function and its derivative because these values are different (the same meters and kilograms) the authors say that “pure” mathematics does not connect a function and its derivative with any physical quantities, for example with distance and speed. They also does not agree to change the form of the problem but to keep the essence (derivation and solving the unequality): to find values of x in which the derivative more (less) than zero. From this it follows that we can draw two or more curves in a single plot only if they are of the same dimension (length, time, force, etc). Otherwise, a reader will apply himself to the meaning of their cross-points while they have no meaning. Often we need to represent only definite combination of the arguments and functions. The following example illustrates this thesis. The function returns the cost of a used car depending of its age and run considering the mean speed (i.e. run divided by age) within the range from one to two kilometers per hour. Fig. 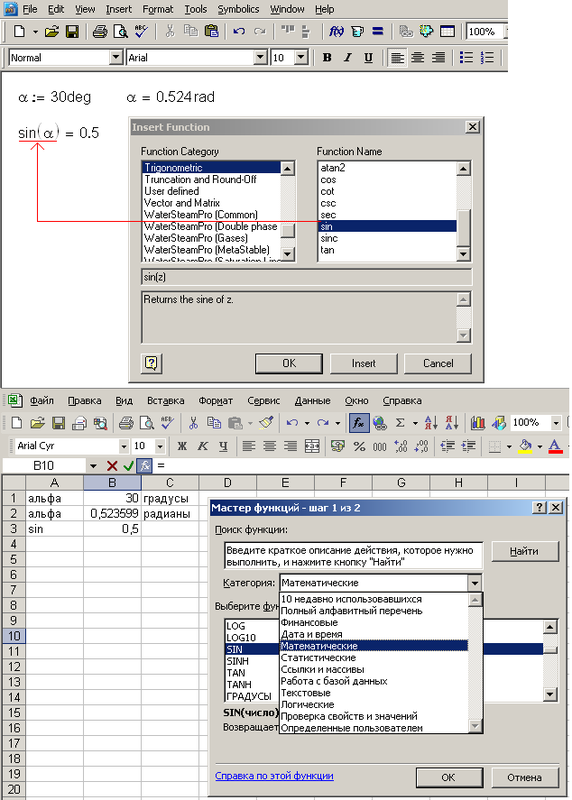 1.68 shows that we insert the penalty into function Цена (Cost): if the real mean speed is out of that range the function returns not the value but the text which is ignored on the graph. A limitation of Mathcad 2D plotting is that variation range of the arguments must be rectangular only. By default, the range is set square having spread in values х and у from -5 to 5 and then a user varying these numbers can make it rectangular. This range can be changed via correspondent settings QuickPlot Data of the 3D Plot Format dialog box but it is better to do it by function CreateMesh (see Fig. 1.69). Function CreateMesh in Fig. 1.69 help us, first, to draw the surface (semi-transparent) and level lines (lying on the x-y plane) within the range determined by variables x1, x2, y1, and y2 and, second, to draw isolines by x and y axes that are in essence the surfaces pared down to the lines. The variation range can have complicated contour in the real problems. Here is an example required non-rectangular variation range of the arguments in graphic solution (Fig. 1.70). The limitation shown in Fig. 1.70 could be bypassed in the following way. If the value of L (length of the cylinder) becomes negative, function S returns not the complex number but zero. In addition, we imposed a restriction to the problem: the ration of the tank diameter to its length must be more than 0.5. After these restrictions (real L≥0 and forced 2R/(R+L+H)>0.5) had been inserted into function S its level lines became to were drawn within non-rectangular (trapezium-shape) variation range R and H (non-rectangular variation range of the function of two variables is discussed in Ch. 3 that considers the problem of triangular diagram). Fig. 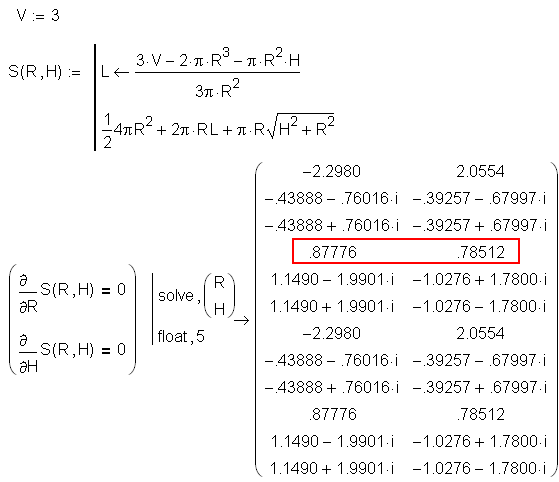 1.71 shows the analytical solution of problem of optimal tank, the system of two non-linear equations (partial derivatives of the function S with respect to arguments R and H) that returns 12 roots one of which (R=0.87776 and L=0.78512) is the coordinate of the “deepest place” on Fig. 1.70. Fig. 1.72 shows other two methods from the large number of “ruses” which we need to draw the graphs. To draw the graph of the type f(x,y)=0 we can remind that it is nothing else than a zero level line of the contour graph of a function of two arguments. 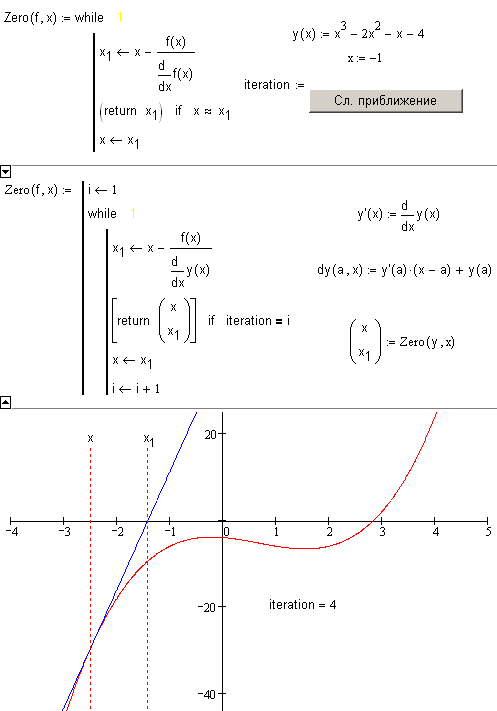 This figure shows that “paying” with formats of 3D graph, turning it from surface (Surface Plot) to level lines (Counter Plot) we can solve the problem both regarding to Bernoulli’s lemniscate (upper graph) and more complicated closed function (bottom graph) which cannot be factorized into definite functions and plotted by the common technique. We described only two ruses of formatting Mathcad plots (see Fig. 1.70 and 1.72). Nevertheless, there are much more of that especially in 3D plotting. Often the graphs are formatted to transport to the books and articles as PrintScreen. In that case, it is useful to insert the graph created in Mathcad to another application, for example to Paint to finish it off. We have to do that if Mathcad has not necessary formatting tools or they are difficult to access, or we do not know about them. The essence of animation in Mathcad and other applications can be explained on the example of old children game. One draws a certain picture (a man in a particular pose) on each page of a notebook changing a picture smoothly from page to page. Turning the pages of such painted notebook, we shall not see the animation effect. Although, pressing and turning it quickly, releasing by a finger we can see the animation. 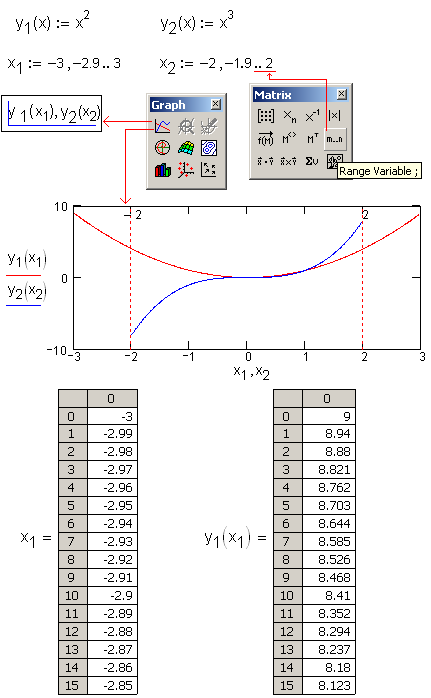 In Mathcad, we can change manually the value of a variable and see changes of a curve on a plot. Doing that quickly we cannot get animation, it is obtained with the picture frequency not less than ten shot per second. Therefore, Mathcad has special animation tools: predefined constant FRAME and two commands Record and Playback from the Tools | Animation menu. Fig. 1.73 shows the stages in creating animation in Mathcad in unusual way: to generate peculiar exe-file. The function named CH2SO4is inserted into the Mathcad worksheet which returns the concentration of sulphuric acid depending on its density (by spline interpolation of the table values keeping in the matrix M – the subject of Ch. 4). A user can set integer values from 1 to 100 for FRAME that vary the variable r from 1to 1.8 (1+ FRAME∙0.008) that, in turn change the value of required variable С. Creating the animation the value of FRAME:= is disabled and the dialog box governs this variable: the variable range (From and To), picture frequency (At – shorts per second). We select the portion of worksheet to animate by dragging with the mouse. Fig. 1.73 shows a dotted rectangle around two operators r= and С=. After that, clicking Animate makes Mathcad change the value of FRAME in specified range and draw obtained shots (pages of the notebook) for their quick displaying (turning the pages). The animation clip (see Play Animation from Fig. 1.73) can be saved on the disk and played back without Mathcad. Why it is not an exe-file!? We can set the value of r (or С) with a slider and compute the value of variable С (or r). In the end of 2003 Mathsoft Engineering & Education, Inc releases Mathcad Application Server (MAS) for operation testing (see the description in Ch. 7) to kill two birds with one stone: separate Mathcad-based applications from Mathcad itself and to publish worksheets online. MAS allows to make worksheets accessible online both for view (that was done long ago) and for calculation. A user (of a Web browser but not Mathcad now) can change the inputs and see the result, numbers, plots, etc, on their browser window. The guide of Mathcad Application Server tells that the button Submit is useless in the “standard” Mathcad worksheets but necessary in the WebSheets, Mathcad worksheets converted to function as Web documents by MAS. This information is inserted even in the Submit Button Properties dialog box. Although, this information (outlined in Fig. 1.74) confuses Mathcad users and cuts a very interesting tool. First, we can manage without this button in WebSheets. After the required changes were made we push the Submit button to transmit that to the MAS server for computing in Mathcad installed in this server. Although, if the inputs are changing only in Web Controls we can format this “net” interface element so that its change and pushing <Enter> results in sending the data on MAS-server without pushing the Submit button which becomes unnecessary in this case. Here we can see analogy with manual mode in Mathcad (Excel, Word, BASIC, Pascal etc.) and compare Submit button with <F9> button which we press after the changes in the worksheet were made by operator := and net and standard Controls and the calculation should be done. 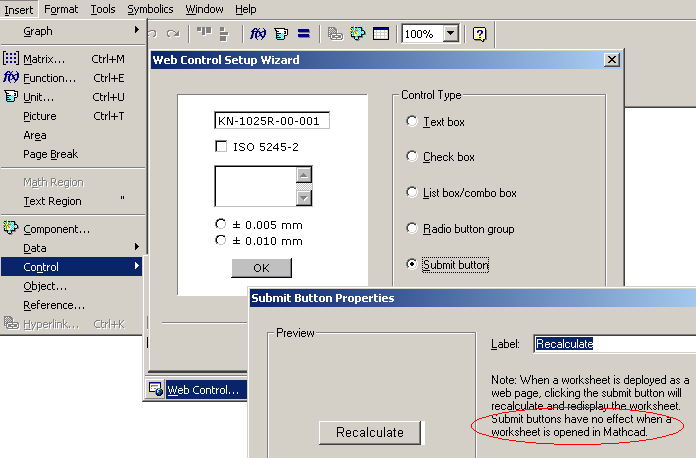 Second, Submit button can be useful both in WebSheets and in worksheets, in traditional Mathcad documents. The point is that pushing of this button increase by one value of the variable connected with Submit (after starting Mathcad in any mode its value equals to one). This variable is a peculiar counter of pushing the Submit button, i. e the number of calling to MAS. This feature of Submit button can be very useful in Internet and out of it: the formal variable can govern The Mathcad worksheet changing it, for example. Thus, Fig. 1.75 show Mathcad worksheet that illustrate the Newton method of numerical finding zero of the function where pushing the Submit button allows us to see approximation step by step. As a rule, in that case, one reads the necessary file or visits the Resource Center. Another name for a toolbar is “palette” where a mouse cursor, like a brush, takes the “paint”, the necessary instrument to solve a problem. Talking about the numeric interface, note that digital keyboards of calculators (computers) and phones are antipodes: the first have numbers one, two, and three on the bottom, the second on the top. The arrangement probably cannot be changed now, although these two devices come to meet each other (Pocket PC and SmartPhone). The Mathcad developers often note, that the environment “originated” from the electronic worksheets but did not adopt their main disadvantage: the formulae are c lose for analysis and modernization. The velocity of light in a vacuum in Mathcad 12 is transferred (copied) from the Reference book into Mathcad itself. Now variable c retains this physical constant. Earlier Mathcad versions included only one constant like that, g ‑ acceleration of gravity. The latest versions of Excel mark pairs of opening and closing parenthesis with different colors at scanning the formula by the pointer when editing a formula. Windows’ own calculator (fig 1.2) also tunes up the decimal system (Dec) by default but can work with hexadecimal (Hex), octal (Oct), and binary (Bin) systems. Entering numbers in Mathcad non-decimal system are shown by the suffix at the end of the number: h – hexadecimal, o – octal, b – binary. The absence of a suffix is a sign that a number is decimal. Similar suffixes finish numbers shown by the operator =. The author has a method of working with students on informatics seminars (see the program at http://twt.mpei.ac.ru/ochkov/Potoki.htm). The author asks students to list any instruments, ideas, modes used in computer science; the same list of defaults in formatting the numerical result. The student who tells the last point gets a bonus. A few may remember that in early BASIC the assignment operator should be written as Let a =. That was done to distinguish the operator from Boolean operator (in Mathcad as was noted before this operator has bold sign and is typed as <Ctrl>+<=>). 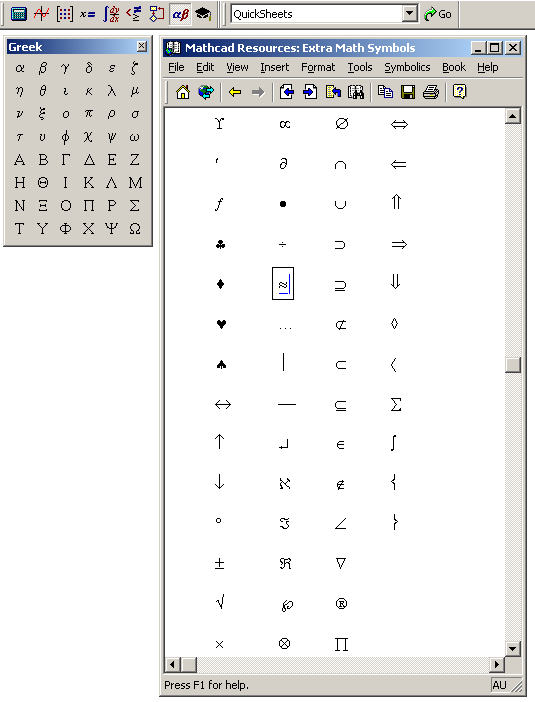 Further it became possible to omit the codeword Let in BASIC programs but the interpreter routine adds it persistently after moving the cursor to the next line. Further it became possible to not use the word although the opportunity to write Let a = instead of a = exists even in Visual Basic. It appeared in Mathcad 7. Of course, there were not any toolbars with button := (see fig. 1.1 and 1.8) in DOS-versions (non-graphic) of Mathcad. Up-to-date Windows versions of Mathcad get as an atavism functional keys <@>, <&>, <$> and others from DOS-versions which introduce to Mathcad worksheet plots (@), integrals (&), sum ($) and others (see fig. 1.33). These keys can be disabled by keystroke <Shift>+<Ctrl>+<k> that change the cursor color from blue into red (emergency state) and vice versa. When the cursor is red one can enter reserved characters noted before and some other into the variable and function name (see sec. 1.2.2). That is often happens in Mathcad forum when someone sends a “problem” worksheet but forgets about the file with source data. We can protect twice Mathcad operators with two different passwords that two men know. These two men can open such banking lock, as each of them knows only one password. One may say that any number of elements of the first set (any number of sets from the first group) correlates with any number of the second (any number from the second group). However, Mathcad could keep these sets if they do not contain too much elements, treat them with techniques described in Ch. 4 obtaining continuous functions. This is a calendar date of 1970, which the reader can calculate himself. At the moment when this text was typed into the computer the function returned the value 1093238417.077. See the beginning of the section with description of correlation between the elements of the sets. We typed in white on black in DOS versions of Mathcad to save fluorescent layer of a screen. Now people change their screens right away when they became obsolescent. This is the point why white screens substitute for the black. Such black rectangles overlap police officers’ faces in the newspaper photos or in TV shots. In the former Russia, a man height was measured in arshins and vershoks. Telling the height the first component was omitted because that of an average person amounted from two up to three arshins. Gerasim from Turgenev’s story “Mumu” was twelve vershoks in height. In addition both the sign and one of components can be invisible. The author often faces with students’ works with comments formed with several variable names. Empiricism is experiment. Empirical formulas are obtained not with theoretical analysis of a phenomenon but with statistical manipulation of the data received from experiments. Here we calculated price of one car brand. This formula was changes in Fig. 1.68 to return not a cost but the percent of a new cost. In that case, we can apply the formula to all used cars. In earlier versions, we could use steradian (sr) but it becomes dimensionless quantity in Mathcad 12. We can make variable m invisible (see sec. 1.2.3). Natural logarithm of the ratio of two quantities with same name is neper. This dimensionless unit is called after John Napier (1550—1617), Scottish mathematician, inventor of logarithm. Usually decibels are used for sound measurements. Sound intensity is compared with the least I0 — usually I0=0.01 Watt/m2 which human ear can hear. The ratio of measuring sound intensity to the least is possible to calculate but the range is too wide that cause inconvenience. 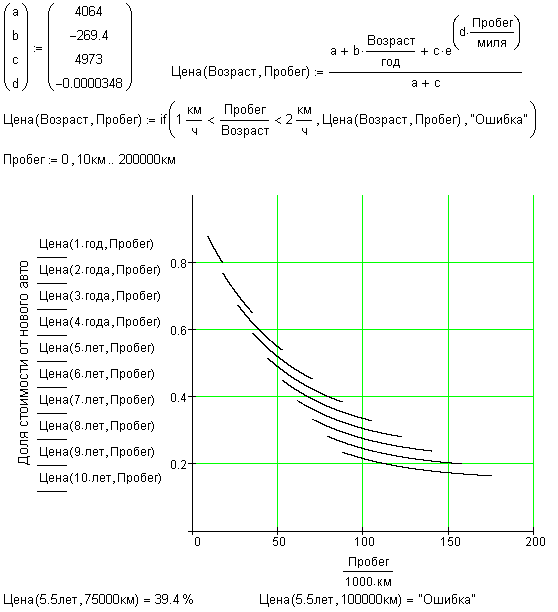 That is removed by introducing of logarithmic scale with decimal multiplier 0.1lg (I/I0). The very loud sound of pneumatic drill has level 80 dB, talks inside a room – 60 db, and hardly heard sound of leaves rustling -- 10dB. The operator defining that function is highlighted to make the function name visible. Calling the function as prefix operator we do not change background color and a user see not dB p=5 dB, but p=5 dB (constant dB is typed by a user; it equals to one and has no effect on the calculation but just imitates the unit). The author thought much about this principle writing this book. On the one hand, the reader requires a detailed description if Mathcad instruments and chapter containing the author’s thoughts and works may be (should be) omitted. Then it will be not a book but manual. Suggestion that is still more cardinal is to forbid us to add the value, even dimensionless, to its square, for example. We can choose other pair of the arguments R and L or L and H. It is possible to optimize all three variables R, L and H (seethe problem in Fig. 3.11 from Ch. 3). Two arguments allow us to make graphical analysis: to plot functions of three and more variables is difficult. Sometime ago it was rumored that Mathcad inserted the “25th shot” to the user animation containing advertisement of the new version.